The district is conducting a 71-acre prescribed burn Monday at the Lake George Conservation Area in Putnam County. The purpose of the burn is to reduce hazardous fuels and reduce hardwood encroachment. The district is conducting a 500-acre prescribed burn on Thursday at the Ogilvie-Betz tract of the Thomas Creek Conservation Area in Nassau County. The purpose of the burn is to reduce hazardous fuels, improve pyric ecosystems and improve wildlife habitat. The district is conducting a 1,925-acre prescribed burn on Tuesday at Seminole Ranch Conservation Area County in portions of Volusia and Brevard counties. The purpose of the burn is to reduce hazardous fuel loads, maintain fire-dependent ecosystems and improve habitat. Vendors small and large are invited to an outreach event on May 9 to learn how to do business with the district. The district is conducting a 204-acre prescribed burn Thursday at the Longleaf Flatwoods Reserve in Alachua County around the trailhead and along County Road 325. The purpose of the burn is to maintain fire-dependent ecosystems and reduce wildland fuel loads. The white trail, portions of the yellow trail and the red/white connector will be closed for the duration of the burn. The district has published its Annual Wetland Activities Report, showing that 449,135 acres of wetlands have been created, protected, enhanced or restored by the district since 1989. This is equivalent to more than 700 square miles of wetlands. 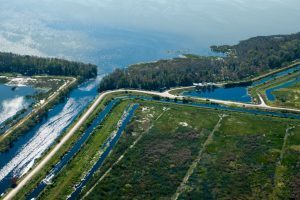 Navigational access near the mouth of the Apopka-Beauclair Canal may be limited as the district enters the final stages of a sump dredge project designed to help improve water quality in Lake Apopka. Additional dredging will also improve navigational access in the area. 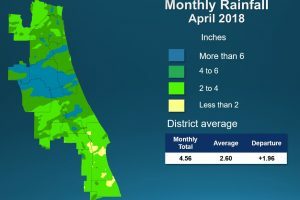 Data collected by the district shows that March rainfall was below average districtwide, with a zone of very low rainfall in Lake, Marion and portions of Volusia County. A full report outlining changing hydrological conditions was presented at today’s Governing Board meeting. 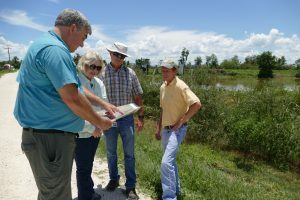 The district’s Governing Board on Tuesday approved moving forward with contracts for eight diverse agricultural projects, totaling nearly $1.3 million in cost-share funds, that will reduce water use by 1.53 million gallons per day and reduce nutrient loading in the Tri County Agricultural Area (TCAA) of Putnam, St. Johns and Flagler counties. Twenty-one projects in 10 counties will share in nearly $16.2 million for construction of water supply and water conservation, water quality improvement and flood protection projects. The district’s Governing Board on Tuesday approved the project ranking for the fiscal year 2019–2020 Annual Districtwide Cost-share Program. 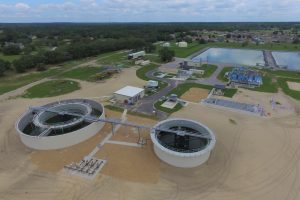 The district and Volusia County have completed construction of a stormwater treatment facility that will improve water quality in the Halifax River and reduce flooding to a 129-acre area. The district is conducting a 340-acre prescribed burn at Seminole Ranch Conservation Area near the Volusia and Brevard county line. The purpose of the burn is to reduce hazardous fuel accumulations, improve wildlife habitat and the maintenance of fire-dependent ecosystems. The district is conducting a 3,000-acre prescribed burn at the Lake Apopka North Shore, east of the Apopka-Beauclair Canal and near the Lake and Orange county line. The district is hosting the Gainesville chapter of the National Wild Turkey Federation (NWTF) and the Florida Fish and Wildlife Conservation Commission for its women’s turkey hunt April 5-7 on portions of the Longleaf Flatwoods Reserve and the Newnans Lake Conservation Area in Alachua County. 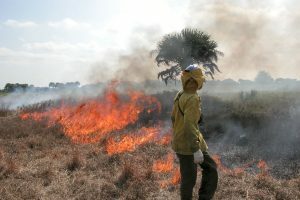 The district is conducting a 4,500-acre prescribed burn on Wednesday at Canaveral Marshes Conservation Area in Brevard County. The purpose of the burn is to reduce hazardous fuel accumulations, enhance wildlife habitat and promote ecological diversity. 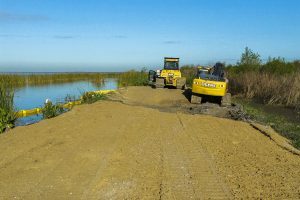 Work is underway to reconstruct about 4.4 miles of levee at the Lake Apopka North Shore. 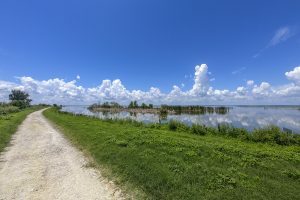 This levee not only serves as a separator between Lake Apopka and the North Shore but is also part of the district’s recreational Lake Apopka Loop Trail. The district is conducting an 830-acre prescribed burn on Friday at Canaveral Marshes Conservation Area in Brevard County. The district is conducting a 700-acre prescribed burn Friday at Seminole Ranch Conservation Area north of Loughman Lodge in Brevard County. 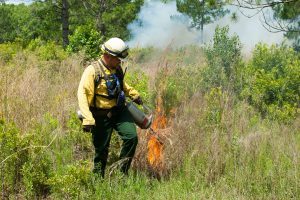 The district is conducting a 280-acre prescribed burn Friday at Pellicer Conservation Area in Flagler County. 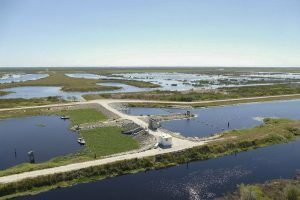 Five years after construction, the district’s Sawgrass Lake Water Management Area (SLWMA) – part of Phase 1 of the C-1 Flow Restoration Project (C-1 Project) – continues to provide outstanding benefit to both the Indian River Lagoon and the St. Johns River by restoring previously diverted stormwater flows back to their natural basin. The district is conducting a 2,990-acre prescribed burn on at Seminole Ranch Conservation Area, west of Hatbill Road and south of Highway 46 in southeast Volusia County. The purpose of the burn is to reduce hazardous fuel accumulations, enhance wildlife habitat and promote ecological diversity. The fire was set by aerial ignition. The district is conducting a 295-acre prescribed burn on the western pastures of Lake Norris Conservation Area in Lake County. The purpose of the burn is to reduce hazardous fuel accumulations. If you’re looking for a quick get-a-way for spring break but don’t want to break the bank, then lands owned by the district offer the perfect one-tank stay-cation. 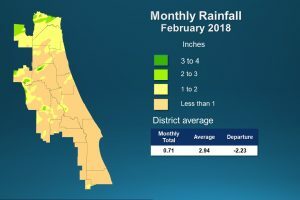 Data collected by the district shows rainfall during February was below average in all areas except Brevard County and parts of Osceola County. 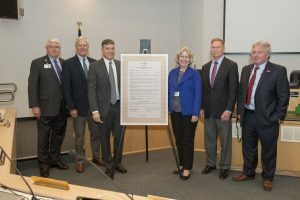 A full report outlining changing hydrological conditions was presented at the district’s March Governing Board meeting, in addition to a proclamation designating April as Water Conservation Month. 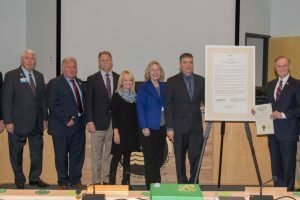 For the sixth consecutive year, the district’s Governing Board has approved a proclamation designating April as Springs Protection Awareness Month. The annual designation helps increase awareness about the importance of Florida’s springs and encourages residents and stakeholders to participate in the protection of springs. The district is conducting a 230-acre prescribed burn on the northeastern portion of Hal Scott Regional Preserve and Park in Orange County. The purpose of the burn is to reduce hazardous fuel accumulations, improve habitat for listed species and the maintenance of fire-dependent ecosystems. With more than 600,000 cubic yards of muck already removed from the Eau Gallie River in Melbourne, the district is scheduled to embark on the final leg of dredging on March 11. The district is conducting a 127-acre prescribed burn on the northeastern portion of Hal Scott Regional Preserve and Park in Orange County. The purpose of the burn is to reduce hazardous fuel accumulations, improve habitat for listed species and the maintenance of fire-dependent ecosystems. A partnership between the district, city of Apopka and Orange Audubon Society is bringing a new community birding park to the Lake Apopka North Shore. The district is conducting a 1,000-acre prescribed burn Wednesday at Fellsmere Water Management Area in Indian River County. The district is conducting a 118-acre prescribed burn at the River Styx Tract of Longleaf Flatwoods Reserve in Alachua County, 2.5 miles northwest of the intersection of county roads 325 and 346. The purpose of the burn is to reintroduce fire to fire-dependent ecosystems and reduce hazardous fuel loads. 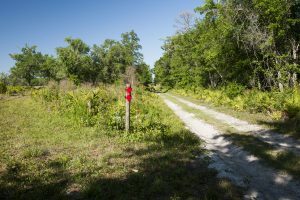 Portions of recreational trails at the district’s Lake Apopka North Shore will close as work to reconstruct about 4.4 miles of levee begins March 4. 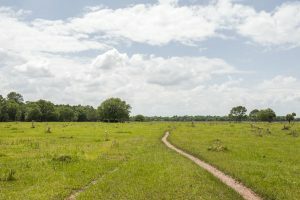 This levee not only serves as a separator between Lake Apopka and the North Shore but is also part of the district’s recreational Lake Apopka Loop Trail. The district is conducting a 950-acre prescribed burn at the Sunnyhill Restoration Area in Marion County, near the northern half of the levee trail and the west side of the red loop, along the Ocklawaha River. 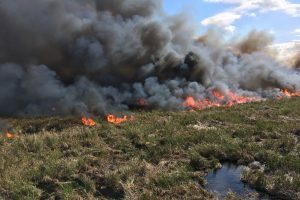 The purpose of the burn is to maintain fire-dependent wetland communities and enhance marsh restoration project sites within the former muck farms. The district is conducting a 1,300-acre prescribed burn at Sunnyhill Restoration Area in Marion County, north of Highway 42 and east of the Ocklawaha River. The purpose of the burn is to reduce hazardous fuel accumulations and the maintenance of fire-dependent ecosystems. The district is conducting a 446-acre prescribed burn on the southeastern portion of Hal Scott Regional Preserve and Park in Orange County. The purpose of the burn is to reduce hazardous fuel accumulations, improve habitat for listed species and the maintenance of fire-dependent ecosystems. 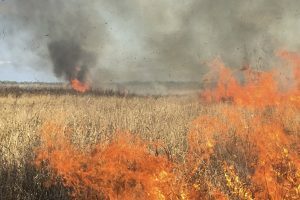 The district is conducting a 106-acre prescribed burn Monday at Ocklawaha Prairie Restoration Area, near the intersection of Southeast Maricamp Road and Southeast 114th Street Road in Marion County. The purpose of the burn is to reduce hazardous fuel loads and maintain fire-dependent natural communities. The district is conducting an 800-acre prescribed burn Sunday at Fort Drum Marsh Conservation Area in Indian River County. The burn’s purpose is wildfire fuel reduction, control of exotic vegetation and maintenance of fire-dependent ecosystems. 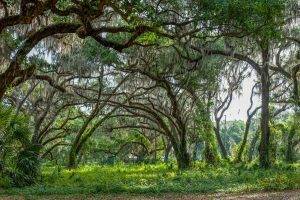 A land management update and the Upper St. Johns River Basin project are among the items to be discussed Feb. 21 during the district’s Southern Recreational Public Meeting. 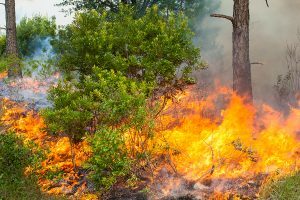 The district is conducting a 129-acre prescribed fire Friday at the River Styx tract of Longleaf Flatwoods Reserve, just over two miles northwest of the intersection of County Road 325 and Country Road 346 in Alachua County. The purpose of the burn is to reintroduce fire to fire-dependent ecosystems and reduce hazardous fuel loads. 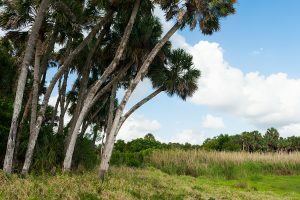 The seasonal wildlife drive at the district’s Emeralda Marsh Conservation Area will reopen this week. 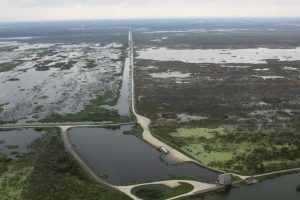 The district’s Governing Board has approved a contract for work to reconstruct about 4.7 miles of levee on the east side of the Lake Apopka North Shore, between Magnolia Park and Laughlin Road. Thirteen agricultural projects will share in $1.2 million from the District to improve water conservation and reduce the amount of nutrients flowing into area waterways. The district’s Governing Board approved the project ranking at Tuesday’s meeting. 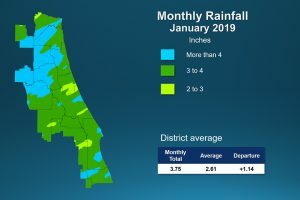 Rainfall during January 2019 was above average across the 18 counties of the district. A full report outlining hydrological conditions was presented at the district’s February Governing Board meeting, held offsite today at the University of Central Florida. 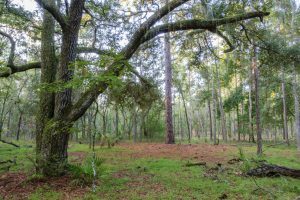 The district and Florida Fish and Wildlife Conservation Commission (FWC) are partnering to open Silver Springs Forest Conservation Area in Marion County as a Public Small-Game Hunting Area this year, with the intent to convert it to a Wildlife Management Area in the future. More than 65 percent of the district’s conservation lands are open to hunting. The district is conducting a 178-acre prescribed burn Friday on the northeastern portion of Hal Scott Regional Preserve and Park in Orange County. The purpose of the burn is to reduce hazardous fuel accumulations, improve habitat for listed species and the maintenance of fire-dependent ecosystems. The district is conducting a 174-acre prescribed burn Thursday at the Lake George Conservation Area within a half mile of Lake George, between Middle and Bar roads in Volusia County. The purpose of the burn is to reduce hazardous fuel loads and improve natural habitat. The district is conducting a 483-acre prescribed burn on the northeastern portion of Hal Scott Regional Preserve and Park in Orange County. The purpose of the burn is to reduce hazardous fuel accumulations, improve habitat for listed species and the maintenance of fire-dependent ecosystems. The district is conducting a 1,080-acre prescribed burn Wednesday at the Lake George Conservation Area along the south side of Georgetown-Denver Road, east of Truck Trail 2 and north of the Harris Grade, in Putnam County. The purpose of the burn is to reduce hazardous fuel loads and maintain fire-dependent natural communities. The district is conducting a 182-acre prescribed burn Tuesday at the Lake George Conservation Area just south of the Putnam/Volusia county line, adjacent to and east of Truck Trail 2 and west of Aces Road. The purpose of the burn is to reduce hazardous fuel loads and release year-old longleaf pine seedlings. 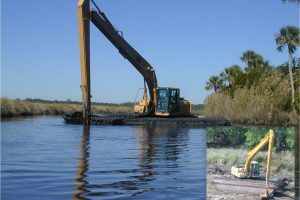 The district will offer stakeholders and residents an opportunity to see the “marsh buggy” excavating equipment up close at Gamble Rogers Memorial State Recreation Area in Flagler Beach on Jan. 28 at 1:30 p.m. 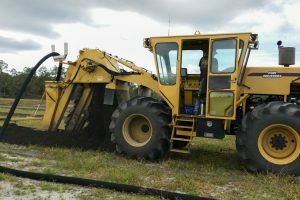 This excavator is specialized equipment that will be used to return dragline ditch spoil mounds to wetland elevation in the Flagler County Wetland Restoration Project. 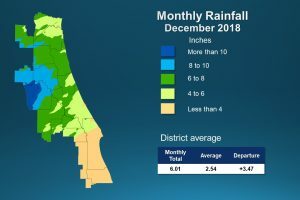 Data collected by the district shows rainfall during December 2018 as a mixed bag depending on whether you live in north or central Florida or in the district’s southernmost counties. 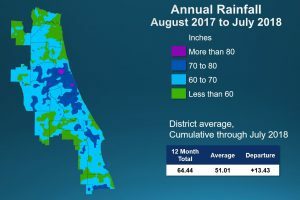 Rainfall was above average in most areas, except for a zone of below-average rainfall in the district’s southernmost counties. The district is conducting a 5,600-acre prescribed burn Friday at the Fellsmere Water Management Area in Indian River County. The purpose of the burn is to reduce hazardous fuel accumulations and previously treated exotic vegetation. 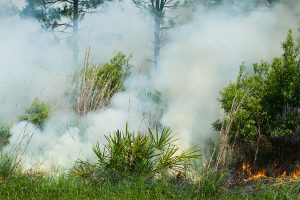 The district is conducting a 40-acre prescribed burn Wednesday at Fort Drum Marsh Conservation Area in Indian River County. The district is conducting a 194-acre prescribed burn Wednesday at the Heart Island Conservation Area in Volusia County near the crossroads of Bullpen Road and Flat Road. The purpose of the burn is to reduce hazardous fuel loads and prepare for tree planting. The district is conducting a 200-acre controlled burn Wednesday at the Hatchet Creek tract of the Newnans Lake Conservation Area, just south of Northeast 69th Avenue in Alachua County. The purpose of the burn is to reduce hazardous fuel loads and maintain fire-dependent ecosystems. 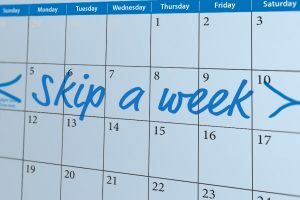 The district is reminding homeowners across its 18-county region about the “Skip a Week” campaign to save water. During the cooler months of December, January and February, weekly irrigation isn’t always needed. 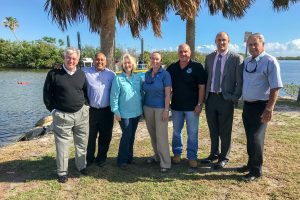 A three-phase septic-to-sewer and stormwater treatment project in Merritt Island will benefit water quality in the Indian River Lagoon —— including Banana River Lagoon —thanks in large part to a cost-share grant from the district. The district will hold its regular monthly Governing Board meeting on Tuesday, Jan. 15, at its Palatka headquarters. The district’s Crescent Lake Conservation Area will host veteran’s group Operation Outdoor Freedom for a guided deer hunt Jan. 7-11. The property will remain open to recreation during this time; signage about the hunt will be placed at property entry points. The district is accepting applications through Feb. 15 to share in cost-share funding for water supply, water quality, natural systems and flood protection construction projects. The district is conducting an 80-acre prescribed burn at the Silver Springs Forest Conservation Area in Marion County, east of the County Road 35 parking area. The purpose of the burn is to reduce hazardous fuel accumulations and the maintenance of fire-dependent ecosystems. The district is conducting a 20-acre controlled burn Wednesday on the western side of Lake Apopka North Shore, in Orange County. The purpose of the burn is to prepare the site for seed application in January. 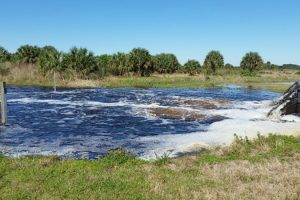 The Florida Department of Environmental Protection (DEP) on Friday presented a $2.45 million check to the St. Johns River Water Management District toward a project to clean up Melbourne’s Crane Creek, a tributary of the Indian River Lagoon. The district Governing Board on Tuesday approved the ranking of projects to share in up to $2.83 million in cost-share funds to benefit water resources in Rural Economic Development Initiative (REDI) communities and for projects that use innovative technology to provide data supporting future permitting and full-scale implementation of alternative water supplies. The district’s Governing Board voted Tuesday to transfer its Edgefield property, including the Dog Branch Regional Stormwater Treatment Facility, to Putnam County. The transfer will help Putnam County meet its obligation under state water quality rules to reduce nutrients entering the St. Johns River. 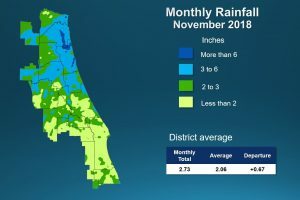 Data collected by the district shows rainfall during November was above average in most areas, except for a zone of below-average rainfall in the district’s southernmost counties. A full report outlining hydrological conditions was presented at the district’s December Governing Board meeting. The district is conducting a 1,500-acre prescribed burn Friday at Fellsmere Water Management Area in Indian River County. The district is asking homeowners across its 18-county region to join the statewide “Skip a Week” campaign to save water during the cooler months of December, January and February when weekly irrigation isn’t always needed. The district is hosting the Gainesville chapter of the National Wild Turkey Federation (NWTF) and the Florida Fish and Wildlife Conservation Commission for its youth deer hunt Dec. 1–2 on portions of the Longleaf Flatwoods Reserve and the Newnans Lake Conservation Area in Alachua County. 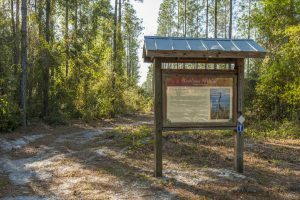 A small section of the Three Forks Trail in Indian River County will be closed until June due to a construction project in the Upper St. Johns River Basin. The district’s Seminole Ranch Conservation Area will host veteran’s group Operation Outdoor Freedom for a guided deer hunt Nov. 27–29. The property will remain open to recreation during this time; signage about the hunt will be placed at property entry points. Thanks to a $51,000 award from the U.S. 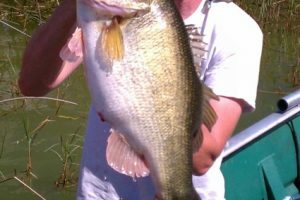 Fish and Wildlife Service (USFWS), habitat improvements will occur at district properties: Hal Scott Regional Preserve and Park in Orange County, Lake Monroe Conservation Area in Volusia County and Pellicer Creek Conservation Area in Flagler County. The district will provide matching funds and in-kind services. 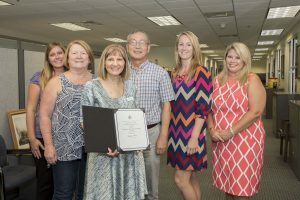 The district has been awarded the Certificate of Achievement for Excellence in Financial Reporting for its fiscal year 2016-2017 Comprehensive Annual Financial Report (CAFR) from the Government Finance Officers Association (GFOA) of the United States and Canada. 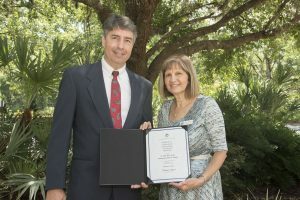 District Accounting Director Greg Rockwell also was recognized. 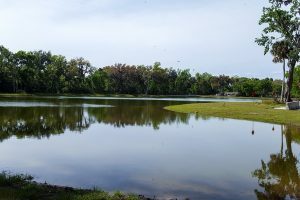 The district Governing Board voted this week to award contracts for water quality projects at Doctors Lake in Clay County and at Lake Apopka in Orange and Lake counties. Projects at each lake will utilize innovative technology to remove phosphorus. The district’s Governing Board will maintain its current slate of officers to serve in the same capacity for another year. Officers are John A. Miklos of Orlando, board chairman; Fred N. Roberts Jr. of Ocala, vice chairman; Charles “Chuck” Drake of Orlando, secretary; and Ron Howse of Cocoa, treasurer. 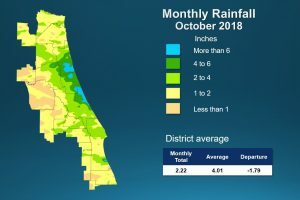 The district data for October shows the month’s rainfall was below average, except for a zone of above-average rainfall along the central coast. The data provided a snapshot of rainfall and surface water conditions across the district’s 18-county service area to the district’s Governing Board Tuesday. The district is hosting the Gainesville chapter of the National Wild Turkey Federation (NWTF) and the Florida Fish and Wildlife Conservation Commission for its youth deer hunt Nov.10–11 on portions of the Longleaf Flatwoods Reserve and the Newnans Lake Conservation Area in Alachua County. The district’s Sunnyhill Restoration Area in Marion County will host veteran’s group Operation Outdoor Freedom for a guided deer hunt Nov. 6–8. Be sure to reset the timer on your irrigation controller when changing your clocks this weekend to mark the end of daylight saving time. The time change corresponds with the semi-annual shift in watering restrictions ensuring the efficient use of water for landscape irrigation across the district. Following irrigation rules helps protect our water resources and can save you money. The Moss Bluff Lock has reopened to boat traffic following maintenance and repair work. The district operates three locks and dams in its 18-county service area to help manage lake levels. The district’s Southern recreational public meeting has been postponed. The public meeting was originally scheduled for Oct. 18 at 6:30 p.m. A new date will be announced as soon as possible. 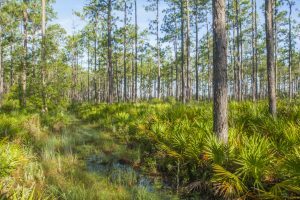 On Nov. 7, the district will hold the second of two community meetings to share information with stakeholders interested in the Flagler County Wetland Restoration Project. The location of the meeting has changed to ensure there is ample seating — the new location will comfortably seat nearly 1,000 people. The district is accepting applications through Nov. 30 from farmers interested in participating in cost-share funding for agricultural projects that promote water conservation and improve water quality in area waterways. 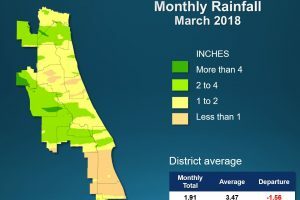 The district recently presented data that provided a snapshot of rainfall, aquifer and surface water conditions across the district’s 18-county service area. 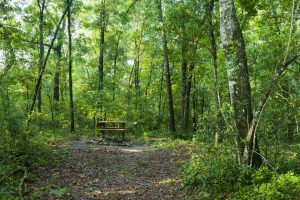 Group camping reservations on St. Johns River Water Management District land just got easier. The district is now using Sunrise Reservations to ensure faster turnaround times for group camping reservations and vehicular access to designated properties. Fourteen schools are receiving grant funding from the district’s Blue School Grant Program for projects to enhance student development in science, technology, engineering and math (STEM) related topics. Thirty-seven teachers applied for funding this year and of them the top 14 projects were selected. 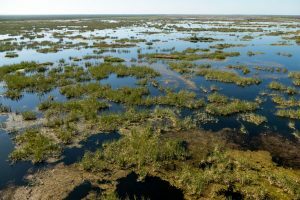 On Oct. 4, the St. Johns River Water Management District will hold the first of two community meetings to exchange information with stakeholders interested in the Flagler County Wetland Restoration Project, a project designed to increase the amount of wetland area, which increases productivity and provides valuable habitat. The district’s Governing Board on Tuesday adopted its fiscal year 2018-2019 budget, which reduces the millage rate for taxpayers for a sixth consecutive year. 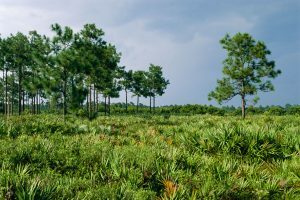 The district will hold two community meetings to exchange information with stakeholders interested in the Flagler County Wetland Restoration Project, a project designed to increase the amount of wetland area, which increases productivity and provides valuable habitat. The district will hold a public meeting and field site tour, kicking off the Wekiva Basin Minimum Flows and Levels (MFLs) surface water model peer review. Construction is underway in Mascotte to replace about 2.5 miles of aging water main. The district provided $500,000 for the project, as part of a Rural Economic Development Initiative (REDI) cost-share grant. The project will be constructed in two phases and help prevent water loss caused by breaks in the water main. The district will hold two public workshops, including a joint workshop with Southwest and South Florida water management districts, on the draft 2018 minimum flows and levels priority list and schedule. 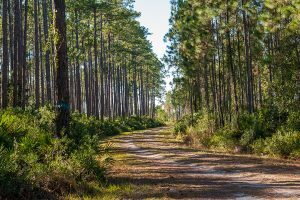 The district is hosting a public meeting to discuss updates to land management and recreation on district lands in Lake, Orange and Seminole counties as well as portions of Marion, Volusia and Brevard counties. The meeting will also include an opportunity for public comment. 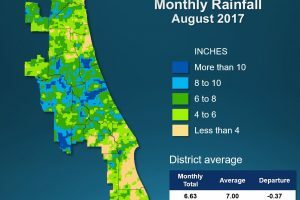 The district Governing Board on Tuesday approved moving forward with contracts for three agricultural projects, totaling nearly $525,500 in cost-share funds, that will reduce water use by 109 million gallons per year and reduce nutrient loading in the Tri County Agricultural Area (TCAA) of Putnam, St. Johns and Flagler counties. As we enter into the peak of hurricane season, we want all residents to have access to the information they need to keep themselves, their families and their communities safe. Florida is especially vulnerable to flooding, given its location and many waterways, and that means Floridians must plan and prepare to weather the inevitable storms. The district is accepting applications through Oct. 18 for Rural Economic Development Initiative (REDI) communities and innovative projects to share in cost-share funding that supports the agency’s water resource protection mission. As a tropical wave is forecast to approach Florida over the Labor Day weekend, district staff are closely monitoring water levels in the St. Johns and Ocklawaha rivers and advising homeowners to prepare for potential impacts from possible heavy rainfall. 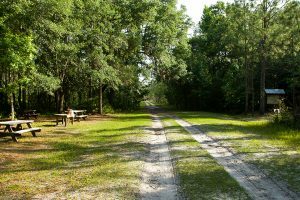 The district is reopening the eastern portion of the Lake Apopka Loop Trail on Sept. 1, which experienced damage due to Hurricane Irma. 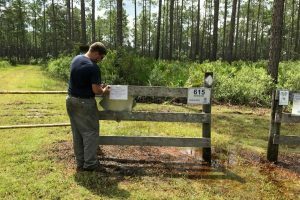 The St. Johns River Water Management District is accepting applications through Sept. 14, 2018, from farmers and ranchers interested in seeking funding through the Agricultural Cost-share Program for agricultural projects that promote water conservation and reduction of nutrient runoff in the Silver Springs springshed. If nature is your thing, geocaching is a great way to explore some of the scenic and unspoiled public lands owned by the district, enjoy the outdoors and celebrate International Geocache Day on Saturday, Aug. 18. 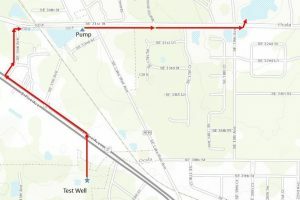 The district will present construction details for one of the dispersed water storage pilot projects in progress in the Indian River Lagoon drainage area at a meeting Aug. 22. 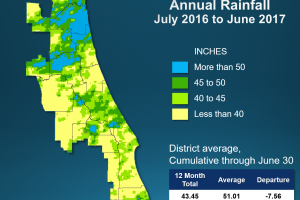 Despite July’s patchy rainfall, 12-month rainfall totals remain above average across the district. A report outlining hydrologic conditions was presented today to the district’s Governing Board. The district is conducting a prescribed burn at Lochloosa Wildlife Conservation Area in Alachua County south of Fish Camp Road, north of Garrison Hammock Road and adjacent to the west shore of Lochloosa Lake. The purpose of the burn is to reduce hazardous fuels and maintain the ecology of the site. 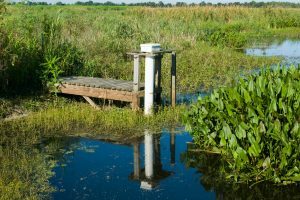 The district will hold a public workshop to discuss the peer review of Minimum Flows and Levels (MFLs) for water bodies within the Central Florida Water Initiative (CFWI) area. This workshop will include discussion of surface water model peer review plans for MFLs water bodies within the Wekiva Basin. 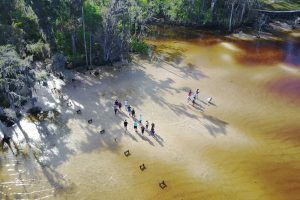 Teachers have just one more month, until Sept. 7, to apply for a Blue School Grant for education projects to enhance students’ knowledge about Florida’s water resources. The district is offering up to $20,000 in grants for education projects that promote hands-on learning about water resources. 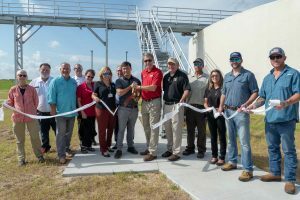 Community leaders joined together in Eustis today to celebrate the completion of a wastewater treatment plant expansion that will serve new development in the area as well as provide more reclaimed water. 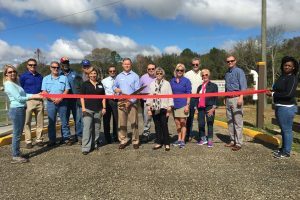 The city of Eustis is hosting a ribbon-cutting ceremony to celebrate the completed expansion of its wastewater treatment plant. As part of the event, attendees are also invited to tour the facility, which increased treatment capacity by one million gallons per day (mgd) and will also provide an additional 1.0 mgd of reclaimed water. The district is conducting a 63-acre prescribed burn on Thursday at the Black Creek Ravines Conservation Area in Clay County. The purpose of the burn is to reduce hazardous fuels and maintain pyric ecosystems. The acquisition of a 240-acre parcel in Marion County will help the district protect water resources by eliminating an outparcel near the center of the district’s Sunnyhill Restoration Area. The land purchase was approved at today’s Governing Board meeting. 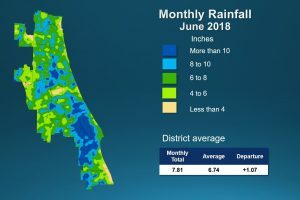 While rainfall has not reached record-breaking levels, June continued a trend of higher-than-average rainfall for counties within the district. A full hydrological report was presented during today’s governing board meeting. The district’s Governing Board Tuesday approved a tentative budget that reduces the millage rate for taxpayers for a sixth consecutive year while continuing to provide significant funds for programs and projects to ensure sustainable water resources, increase water conservation and protect water quality in springs and other priority water bodies. 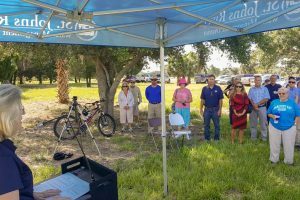 Today, outdoor lovers celebrated the opening of the district’s latest property available for recreation: Micco Water Management Area (WMA) in south Brevard. The district is conducting a 165-acre prescribed burn on the Heart Island Conservation Area along the south side of Deep Creek Road, a quarter mile east of the U.S. 17 trailhead, in Volusia County. The purpose of the burn is to reduce hazardous fuels and promote ecological diversity. The district is giving away limited edition geocache coins to adventurers visiting district recreational public lands between June 21 and Aug. 18. The first 50 people who visit at least three different district lands and post a collection of “selfies” in front of the properties’ entrance signs on district social media sites are eligible. 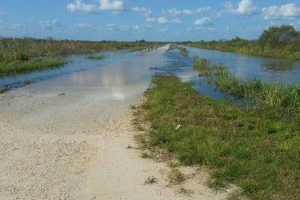 High water levels in and near the St. Johns River have prompted the district to temporarily close campsites at Seminole Ranch Conservation Area in Brevard County and Buck Lake Conservation Area in Volusia County. The district is conducting a 212-acre prescribed fire Tuesday at the Longleaf Flatwoods Reserve in Alachua County. The purpose of the burn is to maintain fire-dependent natural communities and reduce hazardous fuel loads. The district’s regularly scheduled Southern Recreational Public Meeting is set to take place Thursday. The district is conducting a 128-acre prescribed fire on the Hatchet Creek Tract of the Newnans Lake Conservation Area in Alachua County. The purpose of the burn is to maintain fire-dependent ecosystems and reduce wildland fuel loads. With nearly 1,500 lakes within its boundaries, the district will recognize July 2018 as Lakes Appreciation Month to increase public awareness about the value of Florida’s lakes and to encourage behaviors that will enhance lakes’ health. May’s wet weather pushed rainfall totals across the St. Johns River Water Management District to double the average. 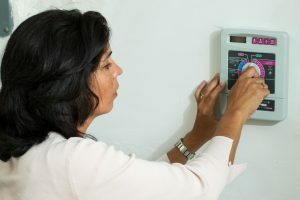 With subtropical storm Alberto having already swept through the Florida panhandle and hurricane season arriving June 1, the district is ready for any action this storm season may bring. The district is conducting a 51-acre prescribed burn Thursday on the northwest corner of the Longleaf Flatwoods Reserve, a mile west of County Road 325, in Alachua County. The purpose of the burn is to reduce hazardous fuel loads and maintain fire-dependent natural communities. 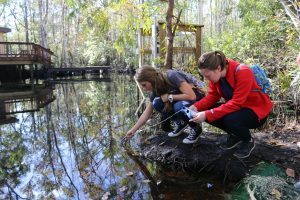 Now entering the third year of its Blue School Grant Program, the district plans to offer up to $20,000 in grants for education projects that enhance student knowledge of Florida’s water resources through hands-on learning. Two airboat crossings within the Seminole Ranch Conservation Area will be temporarily closed while the district installs block mats, which will help to further stabilize the crossings. The district will hold a rule development workshop on May 24 to discuss and receive stakeholder input on proposed rule amendments updating the types of consumptive use permits that may be delegated to district staff to approve. More than 207 million gallons of reclaimed water is reused daily within the district. 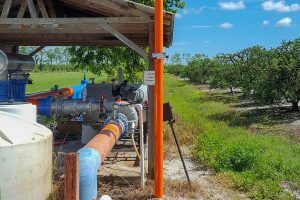 Next week, May 13-19, the district, Florida Department of Environmental Protection (FDEP) and fellow agencies across the state will recognize the benefits of reusing treated wastewater, or reclaimed water. The district is conducting a 26-acre prescribed burn Wednesday at Longleaf Flatwoods Reserve in Alachua County, west of the field station. The purpose of the burn is to reduce hazardous fuel loads and maintain fire-dependent natural communities. The district Governing Board on Tuesday authorized staff to initiate the rulemaking process to revise the existing minimum flows and levels (MFLs) for lakes Brooklyn and Geneva near Keystone Heights. 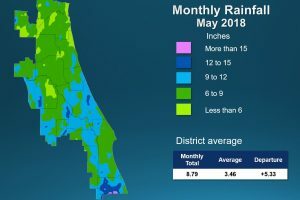 All counties in the district’s service area experienced higher-than-average rainfall during April, with several counties seeing twice their average. Trail repairs are underway on sections of the district’s Lake Apopka Loop Trail. The work, which requires closing the lakeside section of the Lake Apopka Wildlife Drive, will repair damage from Hurricane Irma. 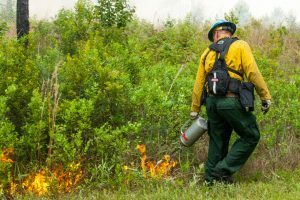 The district is conducting an 80-acre prescribed fire Tuesday on the eastern end of the Julington-Durbin Preserve in Duval County, near the parking area. The purpose of the burn to maintain fire-dependent natural communities and promote wiregrass reproduction. The district is conducting a 79-acre prescribed burn Thursday at the Crescent Lake Conservation Area, north of the public parking area, in Volusia County. 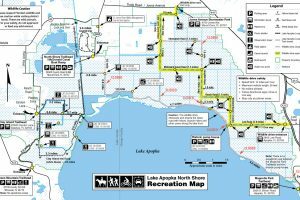 Public access to recreational trails may be intermittently limited. The purpose of the burn is to promote ecological diversity and recruitment of native fire dependent species and to maintain fire dependent natural communities. 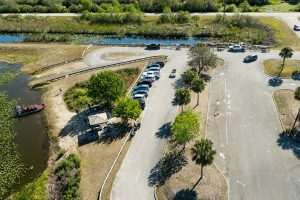 Averaging about 10,000 visitors each month, the district’s Lake Apopka Wildlife Drive will celebrate its third anniversary since opening in May 2015. The district is conducting a 244-acre prescribed burn Thursday at Crescent Lake Conservation Area. The burn will be adjacent to the parking area and the campsite. Trails will be temporarily closed during the burn. The purpose of the burn is to maintain and enhance fire-dependent natural communities. The district is conducting a 130-acre prescribed burn Thursday at the Hatchet Creek tract of the Newnans Lake Conservation Area, approximately 1.5 miles north of the State Road 26 Hatchet Creek Bridge, in Alachua County. The purpose of the burn is to reduce hazardous fuel accumulations and maintain fire-dependent ecosystems. Muck dredging in the Eau Gallie River will pause until early June while manatees are most active in the Indian River Lagoon tributary. Nine agricultural projects will share in more than $918,000 from the district to improve water conservation and reduce nutrient loading to area waterways. 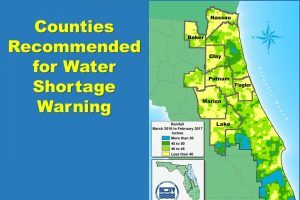 The district Governing Board on Tuesday approved moving forward with contracts for three agricultural projects, totaling nearly $419,000 in cost-share funds, that will reduce water use by 218,537 gallons per day and reduce nutrient loading in the Tri County Agricultural Area (TCAA) of Putnam, St. Johns and Flagler counties. Twenty-seven projects in nine counties will share in nearly $16 million for construction of water supply and water conservation, water quality improvement, flood protection and natural systems restoration projects. 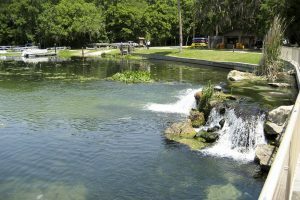 Six projects will share in $699,245 in cost-share funding from the district and the Florida Department of Environmental Protection for agricultural projects that promote water conservation and improve water quality in the Silver Springs springshed. 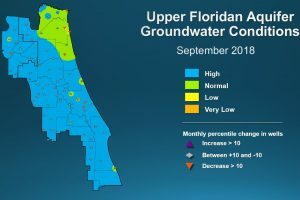 Hydrologic conditions within the district show that while the aquifer is still benefiting from last year’s rain, things are starting to dry out, especially in Orlando and the Upper St. Johns River Basin. The district is conducting a 100-acre prescribed burn Friday at the Black Creek Ravines Conservation Area in Clay County. The purpose of the burn is to reduce hazardous fuel accumulations and the maintenance of fire-dependent ecosystems. The district has opened all areas of the Lake Apopka Wildlife Drive for regular operating hours. The opening includes Interceptor Road, a portion of Laughlin Road, and the lakeside road which had been closed for repairs. 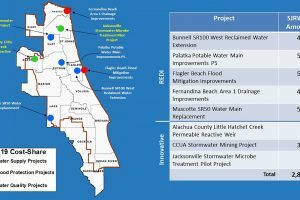 The district and the city of Palatka are coming down the homestretch on three water resource protection projects totaling nearly $2 million. 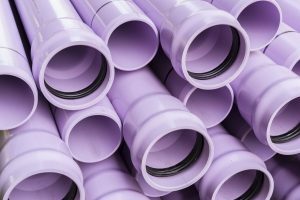 Projects will reduce potable water losses from old cast-iron water pipes, aid in fire suppression and reduce stormwater discharges into the St. Johns River from commercial and residential areas of the city. 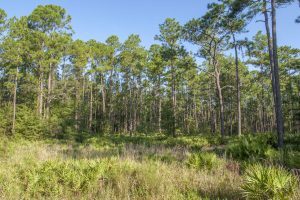 The district has issued an environmental resource permit related to construction of the new First Coast Expressway. 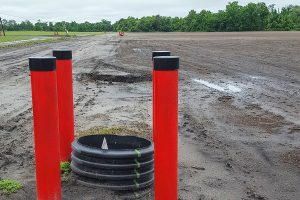 The permit authorizes a stormwater management system for a 31-mile segment of the highway from Blanding Boulevard in Clay County to I-95 in St. Johns County, the second phase of the project. The district’s Sunnyhill Restoration Area in Marion County will host veterans’ group Operation Outdoor Freedom for a guided turkey hunt on March 28 and 29. The district is conducting a 750-acre prescribed burn Thursday in the northeast corner of the Moses Creek Conservation Area in St. Johns County. The purpose of the burn is fuel reduction and maintaining fire-dependent natural communities. 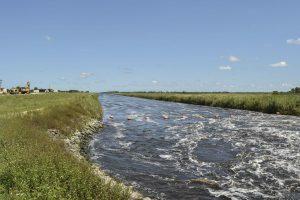 The district’s Governing Board on Tuesday approved a feasibility evaluation of a proposed project to restore the flow between the St. Johns River and the eastern portion of Lake Jesup. 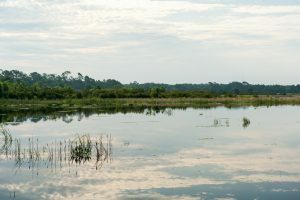 The project would potentially enhance water quality and habitat in the lake and is supported by local stakeholders and Sen. David Simmons, R-Altamonte Springs. The district’s Governing Board on Tuesday approved an agreement with Fellsmere Joint Ventures that will allow for construction of a boat ramp and other amenities at the northeast corner of the 10,000-acre reservoir. 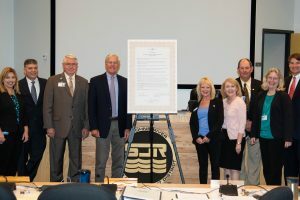 The district’s Governing Board on Tuesday approved a proclamation designating April as Water Conservation Month to encourage awareness about the importance of water conservation. 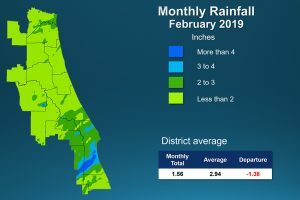 February proved to be a dry month for the 18 counties within the district, with most of the district receiving less than an inch of rain. By comparison, average February rainfall for the district’s southern counties ranged between 2.5 and 3 inches. For the fifth consecutive year, the district’s Governing Board has approved a proclamation designating April as Springs Protection Awareness Month. The annual designation helps increase awareness about the importance of Florida’s springs and encourages residents and stakeholders to participate in the protection of springs. The St. Johns River Water Management District is hosting the Gainesville chapter of the National Wild Turkey Federation (NWTF) and the Florida Fish and Wildlife Conservation Commission (FWC) for its youth turkey hunt March 10–11 on portions of the Longleaf Flatwoods Reserve and the Newnans Lake Conservation Area in Alachua County. The district will begin regrading the roads of the Lake Apopka Wildlife Drive beginning Monday, March 5, 2018. Weekend access will not be affected by the regrading project, which will take place Monday through Thursday each week. 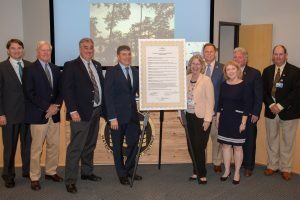 The reconnection of Lake Griffin to Emeralda Marsh Conservation Area in Lake County was a cause for celebration today for the district and its partners, the Florida Fish and Wildlife Conservation Commission (FWC) and Lake County. The district is conducting a 1,030-acre prescribed burn Friday at the Clay Island portion of Lake Apopka North Shore in Lake County. The burn could temporarily delay or detour visitors on the southwest portion of the Loop Trail on Clay Island. The burn’s purpose is to promote biodiversity of fire-dependent species. The district is conducting a 30-acre controlled burn Friday at the Bayard Conservation Area in Clay County. 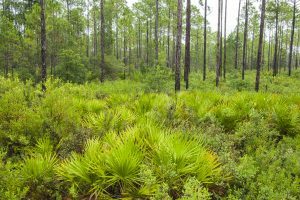 The purpose of the burn is hazardous fuel reduction, ecological enhancement of Bartram’s ixia, a rare wildflower endemic to northeast Florida, and general ecological maintenance. 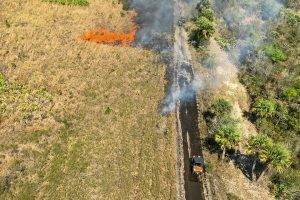 The St. Johns River Water Management District is conducting a 1,741-acre prescribed fire Thursday in Brevard County. The purpose of the burn is to reduce hazardous fuel accumulations, maintain pyric ecosystems, and improve habitat. The fire was set by aerial ignition. The district is conducting a 270-acre prescribed burn Thursday at the Lochloosa Wildlife Conservation Area in Alachua County, along Burnt Island Road to Lake Road. For public safety, Burnt Island Road and Cooter Bob Road and access to the Burnt Island boat launch and fishing pier are closed during the burn. 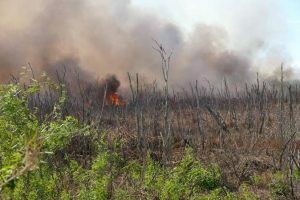 The district is conducting a 235-acre prescribed fire Wednesday at the Lake George Conservation Area in Putnam County, south of Barr’s Road and west of Patty Wiggins Road. The purpose of the burn is to reduce hazardous fuel accumulations and maintain fire-dependent natural communities. The Barr’s Hammock campsite and trails within the burn area will be closed during the burn. The district is conducting a 127-acre prescribed fire Wednesday at the Black Creek Ravines Conservation Area in Clay County. The purpose of the burn is to reintroduce fire into fire-dependent ecosystems. 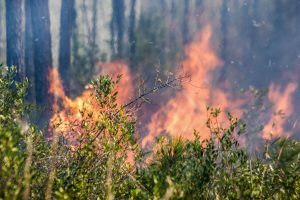 The district is conducting a 358-acre prescribed fire Tuesday at the Lochloosa Wildlife Conservation Area in Alachua County, off U.S. 301 near Burnt Island Road. The purpose of the burn is to reduce hazardous fuels and maintain fire-dependent ecosystems. The district is conducting a 225-acre prescribed burn Tuesday at the Sunnyhill Restoration Area in Marion County, west of the north parking lot along Southeast 182nd Avenue. The purpose of the burn is to reduce hazardous fuel loads and maintain fire-dependent natural communities. Gov. Rick Scott has appointed Allan Roberts of St. Augustine to the St. Johns River Water Management District Governing Board, filling a vacant seat that represents the St. Johns River below the Ocklawaha River and the coastal area between the St. Johns River and Ponce Inlet. The appointment takes effect immediately and runs through March 1, 2020. 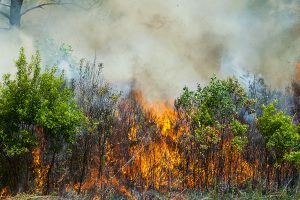 The district is conducting a 98-acre prescribed fire Monday at the Julington-Durbin Preserve in Duval County, near the intersection of Bartram Park Boulevard and Old St. Augustine Road. The purpose of the burn is to reduce hazardous fuels and maintain fire frequency in the sandhill community. The district is conducting a 174-acre prescribed burn Monday at the Heart Island Conservation Area, approximately four miles north of State Road 40 at the end of Chesser Hammock Road, in Volusia County. The purpose of the burn is to reduce hazardous fuel loads and maintain fire-dependent natural communities. The district is conducting a 291-acre controlled burn Friday at the Murphy Island portion of the Murphy Creek Conservation Area in Putnam County, just south of Palatka. The purpose of the burn is to reduce hazardous fuel loads and maintain fire-dependent natural communities. 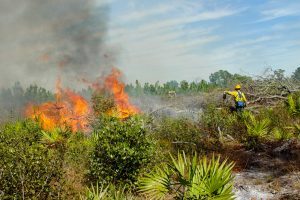 The district is conducting a 1,152-acre controlled burn Friday at the Bayard Conservation Area in Clay County, just south of the Shands Bridge and State Road 16. The purpose of the burn is to reduce hazardous fuel loads and maintain fire-dependent natural communities. The district is conducting a 186-acre controlled burn Friday at the Newnans Lake Conservation Area, a mile north of State Road 26 and just east of Hatchet Creek in Alachua County. The purpose of the burn is to reduce hazardous fuel loads and maintain fire-dependent natural communities. 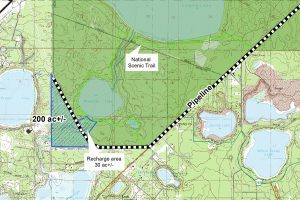 A land management update and the Upper St. Johns River Basin project are among the items to be discussed Feb. 22 during the district’s Southern Recreational Public Meeting. The southern recreational area includes district properties in Brevard and Indian River counties. The public will have an opportunity at this meeting to provide input on recreational topics involving district lands. The St. Johns River Water Management District’s popular wildlife drive at Lake Apopka is open on Presidents’ Day, Monday, Feb. 19. 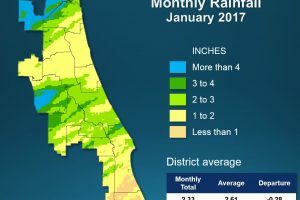 January brought above-average rainfall to north and east-central Florida counties, and Silver Springs in Marion County and Volusia Blue Spring continue to experience flow increases corresponding with greater rainfall received over the past several months. A full report outlining hydrological conditions was presented Tuesday at the district’s February Governing Board meeting. 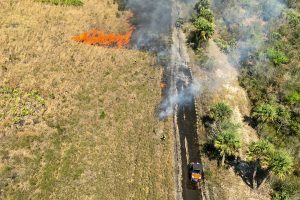 The district is conducting two prescribed fires totaling 5,800 acres in Brevard County. The fire was set by aerial ignition. 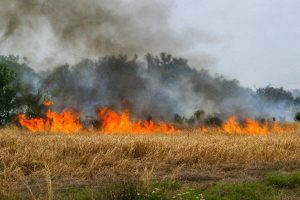 The St. Johns River Water Management District is conducting a 120-acre controlled burn Wednesday at the Bayard Conservation Area along County Road 209 in Clay County. The purpose of the burn is to reduce hazardous fuel accumulations and promote fire-dependent natural communities. The district is conducting a 234-acre controlled burn Wednesday at the Hatchet Creek Tract of the Newnans Lake Conservation Area, north of the Hatchet Creek Bridge on State Road 26, in Alachua County. The purpose of the burn is to reduce hazardous fuel accumulations and promote fire-dependent natural communities. 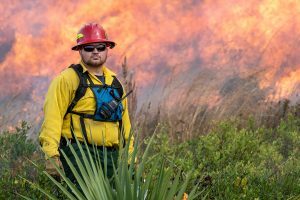 The district is conducting an 1,100-acre prescribed burn Wednesday at the Ocklawaha Prairie Restoration Area in Marion County, on the east side of the river, in conjunction with the U.S. Forest Service, Ocala National Forest. How clean is that river near your home? The district is conducting a 212-acre prescribed burn Tuesday at the Lake George Conservation Area in Putnam County, along the north side of Georgetown Denver Road and along either side of Fill Road. The purpose of the burn is to reduce hazardous fuels and maintain fire-dependent natural communities. The district is conducting a 1,095-acre prescribed burn Friday at the Lake George Conservation Area in Putnam County, between Fish Camp Road and Truck Trail 1. The burn will include both sides of Truck Trail 2, a portion of which will be closed to ensure public safety. The district is conducting a 105-acre prescribed burn Friday in the Long Branch area of the Hal Scott Regional Preserve and Park, near the north end of the property, in Orange County. The district is conducting a 164-acre prescribed burn Thursday on the River Styx portion of Longleaf Flatwoods Reserve in Alachua County, four miles northwest of the intersection of County Roads 325 and 346. The purpose of the burn includes reintroducing fire to a pyric ecosystem and reducing hazardous fuel loads. The district is conducting a 3,500-acre prescribed burn at Moccasin Island in Brevard County, requiring the closure of the tract to public access. The fire was set by aerial ignition. 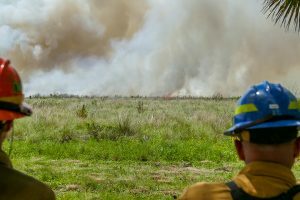 The district is conducting a 273-acre prescribed burn Wednesday at the Lake George Conservation Area in Putnam County, north of Georgetown Denver Road and along either side of Fill Road. The purpose of the burn is to reduce hazardous fuel loads and maintain fire-dependent ecosystems. The district is conducting a 259-acre controlled burn Wednesday at the Newnans Lake Conservation Area in Alachua County, about 2.5 miles south of State Road 26 and immediately west of County Road 234. The purpose of the burn is to reduce hazardous fuel accumulations and maintain fire-dependent natural communities. The district is reopening seven and a half miles of additional trails, including the western end of the Loop Trail on Feb. 2. The district is conducting a 100-acre prescribed fire today at the Julington-Durbin Preserve in Duval County. The purpose of the burn is fuel reduction and maintaining a consistent fire interval. The district is conducting a 171-acre prescribed fire today at the Deep Creek Conservation Area in St. Johns County. The purpose of the burn includes fuel reduction, ecological improvement and maintaining a consistent fire interval. The St. Johns River Water Management District is conducting a 137-acre prescribed fire today at the Julington-Durbin Preserve in Duval County. The purpose of the burn is fuel reduction and preparation for future growing season burns. The district is conducting an 822-acre prescribed burn at the Sunnyhill South tract in Marion County, requiring the closure of the tract to public access. The fire was set by aerial ignition. The district is conducting a 158-acre prescribed burn today at Rice Creek Conservation Area immediately south of State Road 100 and east of the Rice Creek bridge in Putnam County. The purpose of the burn is to reduce hazardous fuel loads and maintain fire-dependent natural communities. The St. Johns River Water Management District is conducting a 226-acre prescribed burn on the Sunnyhill North Tract along the southern boundary and adjacent to the Blue House and district facilities. The purpose of the burn is to reduce hazardous fuels and maintain fire-dependent natural communities. The district is currently accepting applications through Feb. 16, 2018, from farmers and ranchers interested in participating in the districtwide Agricultural Cost-share Program funding for agricultural projects that promote water conservation and reduction of nutrient runoff. The district is conducting a 99-acre prescribed burn at Longleaf Flatwoods Reserve on the River Styx tract, four miles northwest of the intersection of County Road 325 and County Road 346, in Alachua County. The district is conducting a 70-acre prescribed burn at Lake Apopka North Shore directly south of the district’s Lake Apopka Field Station, west of County Road 448A and north of the McDonald Canal boat ramp. The district is conducting a 296-acre prescribed burn on the Sunnyhill Restoration Area South Tract in Marion County, just south of the parking area. The purpose of the burn is to reduce hazardous fuels and increase forage for cattle and wildlife. The district is conducting a prescribed burn today on 300 acres on Moccasin Island just west of Viera. The purpose of the burn is to reduce hazardous fuels that cause wildfires and maintenance of fire-dependent natural communities. The district is conducting a 3,000-acre prescribed fire today on the Lake Apopka North Shore. 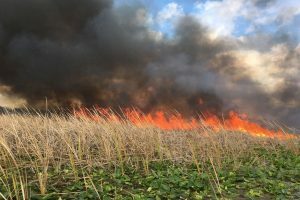 The purpose of the controlled burn is for marsh management, burning hardwoods and cattails and to promote the expansion of native marsh grasses. The fire was set by aerial ignition. 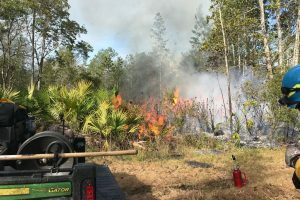 The St. Johns River Water Management District is taking advantage of ideal weather conditions to conduct two prescribed burns at properties; one in Lake County and one in Alachua County. The district is conducting an 87-acre controlled burn today at Hal Scott Regional Preserve and Park, on the northern portion of the property north of Dallas Boulevard, south of County Road 13 and west of State Road 520, in Orange County. The purpose of the burn is ecological maintenance of fire-dependent natural communities and vegetation buildup reduction for wildfire prevention/severity reduction. 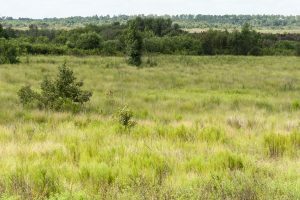 The district’s Governing Board on Tuesday entered a Final Order adopting an administrative law judge’s recommended order to issue a consumptive use permit modification to Sleepy Creek Lands LLC. 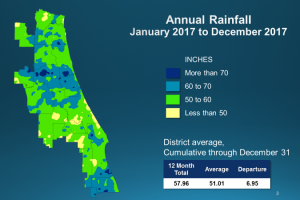 While 12-month rainfall totals are still above average throughout the district’s 18-county service area, December rainfall was below average, especially through the southeastern corridor from southern Lake County through Orlando to Daytona. A full report outlining hydrological conditions was presented at the district’s January Governing Board meeting Tuesday. The district is conducting a 177-acre prescribed burn on the Sunnyhill Restoration Area North Tract in Marion County, at the southeast corner of the property along 182nd Avenue Road. The southern trailhead, off 182nd Avenue, will be closed for the duration of the burn. The purpose of the burn is to reduce hazardous fuels near an adjacent subdivision and maintenance of fire-dependent natural communities. The St. Johns River Water Management District is accepting applications through Feb. 15 to share in cost-share funding for water supply, water quality, natural systems and flood protection construction projects. An informational workshop is being held Jan. 16 at 10 a.m. at district headquarters, 4049 Reid St., Palatka, or via webinar. 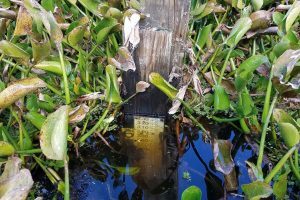 Scientists and engineers with the St. Johns River Water Management District and University of Florida have completed a collaborative multi-year science investigation into the health of priority spring systems. The partnership was launched in 2014 to develop an enhanced scientific foundation to help identify the most effective projects and strategies to protect or restore the district’s Outstanding Florida Springs. The St. Johns River Water Management District is conducting a 25-acre prescribed burn at the River Styx portion of the Longleaf Flatwoods Reserve in Alachua County, about four miles northwest of the intersection of County Road (CR) 325 and CR 346. The purpose of the burn is to reduce hazardous fuel loads and reintroduce fire to a pyric ecosystem. The district is reopening portions of the Lake Apopka Wildlife Drive for regular operating hours Dec. 22. The district is conducting a 39-acre prescribed burn at the Longleaf Flatwoods Reserve in Alachua County, about 1.5 miles northwest of the intersection of County Road (CR) 325 and CR 346 and just west of the Longleaf Flatwoods Field Station. The purpose of the burn is to reduce hazardous fuel loads and maintain fire-dependent natural communities. 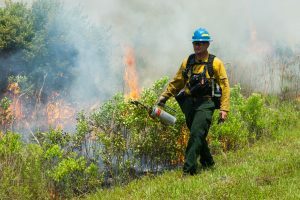 The district is conducting a 400-acre prescribed fire Wednesday at Fort Drum Marsh Conservation Area in Indian River County. The purpose of the controlled burn is for marsh management and fuel reduction. The district is conducting a 163-acre controlled burn at the Newnans Lake Conservation Area in Alachua County, about 1.5 miles north of State Road 26 and just west of Hatchet Creek. The purpose of the burn is to reduce hazardous fuel accumulations and maintain fire-dependent natural communities. The district is conducting a 125-acre controlled burn at Heart Island Conservation Area in Volusia County, about a mile north of Highway 40 along the east side of Chessor Hammock Road (Truck Trail 11). The purpose of the burn is to reduce hazardous fuel loads and maintain fire-dependent natural communities. 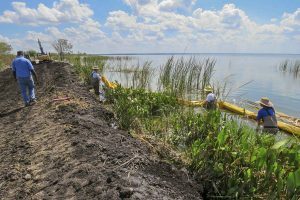 The district has started work on a sump dredge project designed to help improve water quality at Lake Apopka. The project is not expected to impede navigation on the canal or lake. 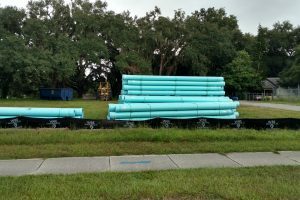 The district is introducing a new cost-share funding opportunity for local governments and utilities within the springsheds of Volusia Blue, Wekiwa and Silver Springs to replace septic tanks with more efficient systems. 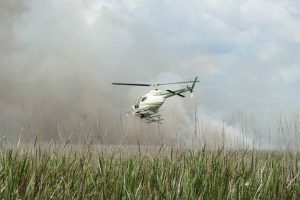 The district is conducting two aerial burns today at the Blue Cypress Conservation Area in Indian River County. The first prescribed burn is 400 acres and located east of County Road 512. The second burn is 800 acres and located north of State Road 60 and west of County Road 512. 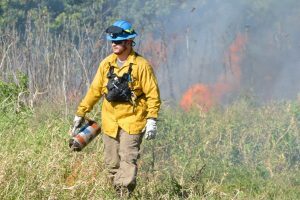 The purpose the burns is to remove invasive plants from a vegetation enhancement area as well as prepare the area for a future restoration project. The district is conducting a 289-acre burn Thursday at the Black Creek Ravines Conservation Area in Clay County. The purpose of the burn is to reduce fuel loads and maintain an appropriate fire return interval. The district is conducting a 99-acre prescribed burn at the Lake George Conservation Area in Putnam County at the intersection of Truck Trail 2 and Harris Fish Camp Road. The purpose of the burn is to reduce hazardous fuel loads and maintain fire-dependent natural communities. 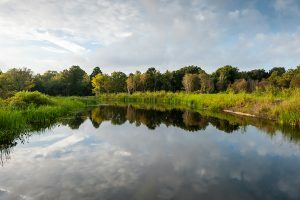 The district Governing Board on Tuesday approved the ranking of projects to share in up to $3.5 million in cost-share funds to benefit water resources in Rural Economic Development Initiative (REDI) communities and for projects that use innovative technology to provide data supporting future permitting and full-scale implementation of alternative water supplies. 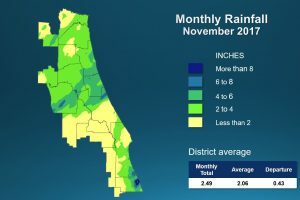 While November brought above-average rainfall to counties across the northern and southern coast of the St. Johns River Water Management District’s 18-county service area, central Florida saw less rain than usual. A full report outlining hydrological conditions was presented at the district’s December Governing Board meeting. 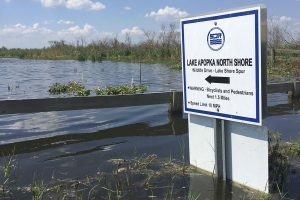 The district continues to assess and repair areas of the Lake Apopka North Shore, which experienced damage due to Hurricane Irma. As water levels subside, the district will provide updates as needed on the status of repairs and recreation at the Lake Apopka North Shore. The district is encouraging homeowners in its 18-county region to “Skip a Week” of lawn and landscape irrigation during the cooler months of December, January and February. The district is conducting a 152-acre prescribed burn today at the Lake Norris Conservation Area in Lake County. The purpose of the burn is to prepare the area for future planting as well as maintain fire-dependent natural communities. The district is conducting a 30-acre prescribed burn today at the Micco Stormwater Park in Brevard County. The purpose of the burn is to prepare the area for a future burn in a few weeks. Fishermen recently netted 100,000 pounds of nutrient-laden gizzard shad from Lake Apopka in one week. The district funds the fish harvest as part of a multifaceted approach to restoring water quality. 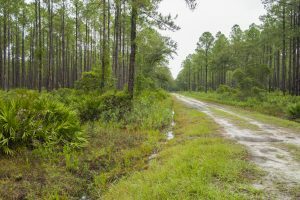 An easement on three acres of county-owned property on Black Creek was approved Tuesday night by the Clay County Board of County Commissioners (BOCC) to implement the Black Creek Water Resource Development Project (WRD), a key component to meeting northeast Florida’s water supply needs. The district continues to assess and repair areas of the Lake Apopka North Shore, which experienced damage due to Hurricane Irma. 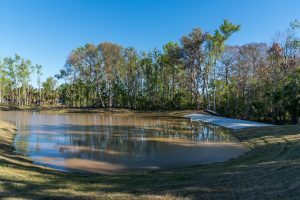 As water levels subside the district is continuing to provide weekly updates on the status of repairs and recreation at the Lake Apopka North Shore. 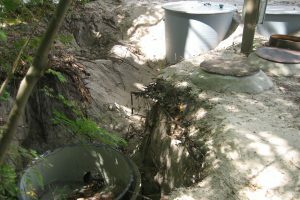 Knowing that septic tanks have been identified as one of the reasons for declining water quality in Florida’s springsheds, the district is working with the Florida Department of Environmental Protection (DEP) and local governments to fund their removal. 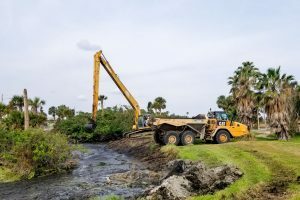 The removal of more than 44,000 cubic yards of muck was a cause for celebration today for the district and its partners, Brevard County and the city of Cocoa Beach. The district is conducting a 122-acre prescribed burn at the Lake George Conservation Area today at the intersection of Cumbie and Denver roads, east of the Jumping Gully group campsite. The purpose of the burn is to reduce hazardous fuel accumulations around an adjacent commercial fernery in preparation for an upcoming aerial burn. The district is conducting a 105-acre prescribed burn today at Lake Apopka North Shore in Lake County. The burn area is in the southwest corner of the property with smoke visible from County Road 455 in Lake County. The purpose of the burn is for the maintenance of fire-dependent ecosystems. 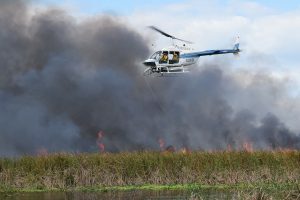 The district is partnering with the Florida Fish and Wildlife Conservation Commission to conduct a 74-acre prescribed burn today at Emeralda Marsh Conservation Area in Lake County. The burn area is located north of Yale Canal and west of Emeralda Island Road. The purpose of the burn is to remove previously treated invasive plants from a vegetation enhancement area. The District is conducting a 329-acre prescribed fire today at the Lake George Conservation Area in Volusia County west of Truck Trail 2 between Barrs Road and Middle Road. 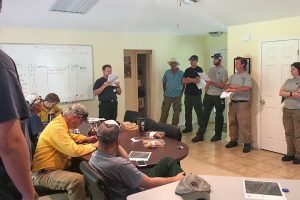 The purpose of the prescribed fire is to reduce hazardous fuel accumulations and improve access for timber marking in preparation for an upcoming timber sale. 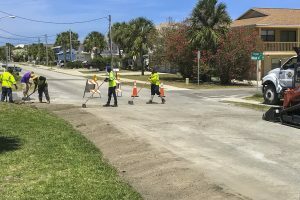 The district and the city of Flagler Beach are partnering on a project to reduce flooding and recurring property damage to the Ocean Palm area and improve water quality. The district’s cost-share program is funding $675,000 toward the project, which is currently under construction. 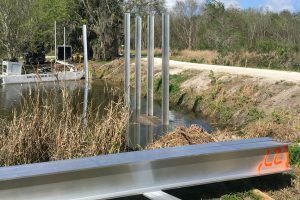 Work is complete on a project that will help improve water quality at Lake Apopka and provide increased flood protection in the town of Oakland. The district provided $184,803 in funding for the project. Repairs are underway at the district’s Lake Apopka North Shore, which experienced damage due to Hurricane Irma. As water levels subside and assessments are completed, the district is continuing to provide weekly updates on the status of repairs and recreation at the Lake Apopka North Shore. The district is conducting a small prescribed burn today at the Lake Apopka North Shore in Orange County. 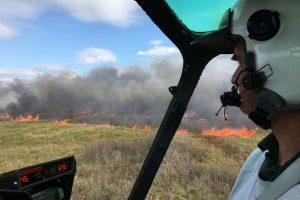 The purpose of the burn is to burn fuels away from sensitive restoration planting areas as the district prepares to perform a larger burn in a few weeks. Twelve agricultural projects will share in $1.5 million from the district to improve water conservation and reduce nutrient loading to area waterways. The district’s Governing Board approved the project ranking at Tuesday’s meeting. The district’s Governing Board on Tuesday re-elected its current slate of officers to serve in the same capacity for another year. October’s rainfall amounts were dominated by the heavy nor’easter rain event at the beginning of the month, leaving the 12-month rainfall total for the district 4.4 inches above average. Dr. Erich Marzolf with the district was recently elected to serve on the North American Lake Management Society Board of Directors. Chances are, the vegetables and maybe even the potato chips you’re buying in your local supermarket are grown on local farms in northeast Florida. 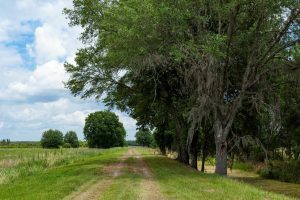 There’s also a good chance those farms are partnering with the district on innovative practices and technologies to lessen groundwater use and reduce agricultural runoff entering the St. Johns River while working to keep their farms productive. The district’s Newnans Lake Conservation Area will host a guided deer hunt for disabled veterans Nov. 5–7. The north tract of the conservation area will be closed throughout the special Operation Outdoor Freedom hunt. 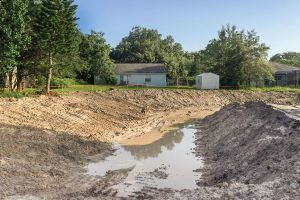 Repairs are underway at the St. Johns River Water Management District’s Lake Apopka North Shore, which experienced damage due to Hurricane Irma. As water levels subside and assessments are completed, the district is continuing to provide weekly updates on the status of repairs and recreation at the Lake Apopka North Shore. Be sure to reset your sprinkler timer when changing your clocks this weekend to mark the end of daylight saving time. The time change corresponds with the semi-annual shift in watering restrictions ensuring the efficient use of water for landscape irrigation across the St. Johns River Water Management District. The move helps protect our water resources and can save residents money. 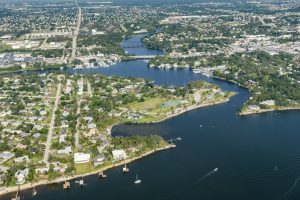 The district and the city of Fernandina Beach are partnering on a project that will help reduce flooding along 26 city blocks while also reducing nutrient loading to the Amelia River. 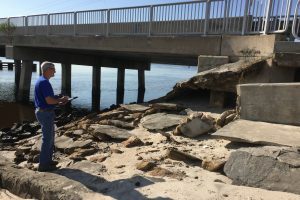 Repairs are underway at the St. Johns River Water Management District’s Lake Apopka North Shore, which experienced damage due to Hurricane Irma. As water levels subside and assessments are completed, the district will provide a weekly update on the status of repairs and recreation at the Lake Apopka North Shore. The Moss Bluff Lock is closed to boat traffic until further notice. 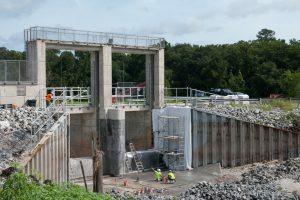 The lock was scheduled for maintenance in September but Hurricane Irma delayed that work. 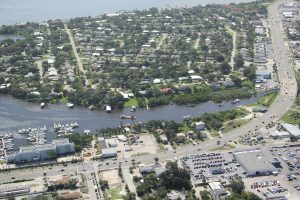 The St. Johns River Water Management District and the city of Jacksonville Beach are partnering to extend central sewer service to eight properties along the Intracoastal Waterway. 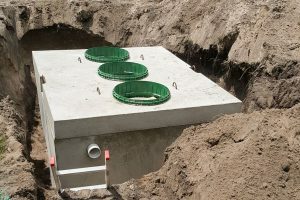 By eliminating septic tanks, the project is anticipated to reduce total nitrogen discharges by 240 pounds per year and total phosphorus discharges by 32 pounds per year. Repairs are underway at the district’s Lake Apopka North Shore, which experienced damage due to Hurricane Irma. As water levels subside and assessments are completed, the district will provide a weekly update on the status of repairs and recreation at the Lake Apopka North Shore. 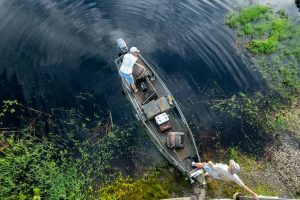 The St. Johns River Water Management District is hosting a public meeting to discuss updates to land management and recreational across Brevard and Indian River counties. The meeting will also include an opportunity for public comment. 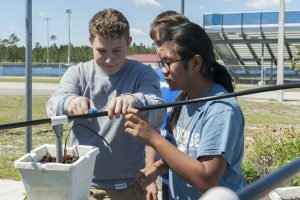 Eleven schools are receiving grant funding from the St. Johns River Water Management District’s Blue School Grant Program for projects to enhance student development in science, technology, engineering and math (STEM) related topics. The district’s Governing Board is commending the city of Altamonte Springs for its award-winning work to expand water resources in Florida. The city’s pureALTA Potable Reuse Demonstration Pilot was recently named the 2017 WaterReuse Innovative Project of the Year at the national WaterReuse Symposium in Phoenix, Ariz. The Central Florida Water Initiative (CFWI) estimates central Florida will need an additional 250 million gallons of water per day by 2035 to meet the demands of a growing population. An update on the CFWI’s work to meet that demand through increased water conservation and alternative water sources was presented today to the St. Johns River Water Management District’s Governing Board. 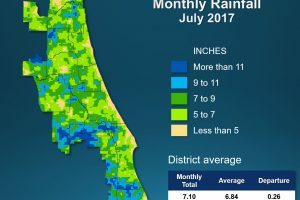 The district Governing Board on Tuesday approved moving forward with contracts for nine agricultural projects, totaling nearly $1.5 million in cost-share funds, that reduce water use by 34 million gallons per year and reduce nutrient loading in the Tri County Agricultural Area (TCAA) of Putnam, St. Johns and Flagler counties. 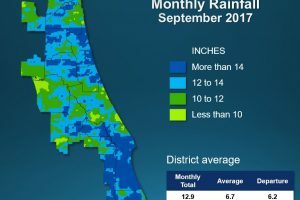 Over two days, Hurricane Irma brought 2.2 trillion gallons of rainwater, or enough to cover 6.7 million football fields in one foot of water, to the district’s 18-county service area. A full report outlining September’s hydrological conditions, flood control system and the district’s response during Hurricane Irma, was presented to the district’s Governing Board Tuesday. 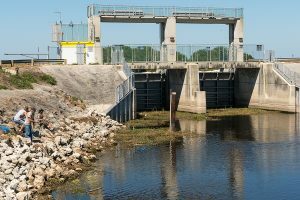 The district has opened water control structures on the 11-mile C-54 Canal in Brevard County to reduce the amount of water flowing north in the St. Johns River. The opening is due to flooding on the St. Johns River, as well as ongoing rainfall and predicted rainfall resulting from Tropical Storm Nate. 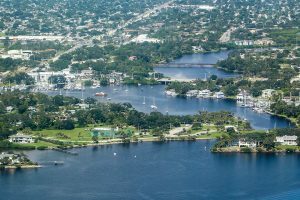 The Indian River Lagoon and cities of Fellsmere and Sebastian in Indian River County will gain improved water quality, thanks in large part to a Rural Economic Development Initiative (REDI) cost-share grant from the district. The district is hosting a public meeting to discuss updates to land management and recreation across Lake, Orange and Seminole counties as well as portions of Marion, Volusia and Brevard counties. The meeting will also include an opportunity for public comment. Repairs are underway at the district’s Lake Apopka North Shore, which experienced damage due to Hurricane Irma. As water levels subside and assessments are completed, the district will provide weekly updates on the status of repairs and recreation at the Lake Apopka North Shore. 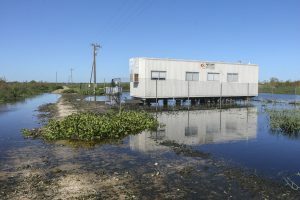 The district closed two water control structures in its Upper St. Johns River Basin project on Sunday to lessen the potential for flooding in residential neighborhoods along Lake Washington, in Brevard County. Repairs are underway in areas of the district’s Lake Apopka North Shore, which experienced damage due to Hurricane Irma. 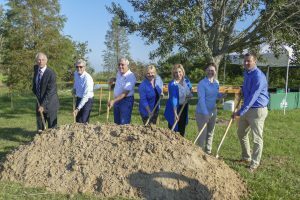 The district joined city of Winter Garden leaders and others to celebrate the start of a reclaimed water and stormwater project. 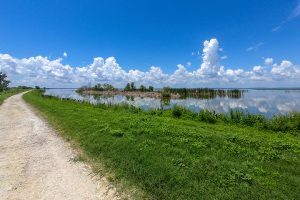 The district provided $750,000 for the work, which captures and stores excess stormwater, improving aquifer recharge and water quality at nearby Lake Apopka. The district’s Governing Board today adopted its fiscal year 2017-2018 budget, which provides funds for cost-share projects and major programs to support the agency’s core missions of water supply, water quality, natural systems and flood protection. The board also approved reducing the millage rate for taxpayers for a fifth year. 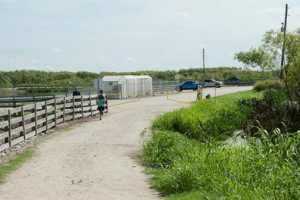 The district has reopened the C-54 Canal to recreation now that the water control structures at either end of the 11-mile-long canal are closed. The district has reopened 40 of its properties following Hurricane Irma’s impact last week. The district continues to assess damage from Hurricane Irma and make repairs to its public lands, with a goal to reopen the properties for recreational uses as soon as it is safe to do so. 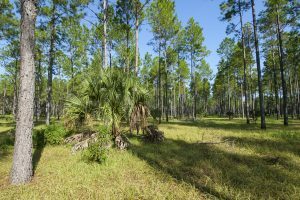 The district has reopened 39 of its conservation lands following Hurricane Irma’s impact last week. The district continues to assess damage from Hurricane Irma and make repairs to its public lands, with a goal to reopen the properties for recreational uses as soon as it is safe to do so. 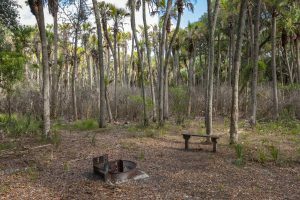 More district conservation lands are reopening to public recreation following Hurricane Irma’s impact last week. 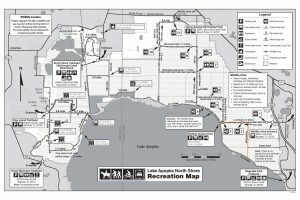 Openings are made as the district continues its in-depth assessment of recreational access points, levees, trails and boat ramps. The district’s Governing Board voted to rescind the districtwide Water Shortage Warning Order following an extended period of increased rainfall. The district is accepting applications through Oct. 19 to share in $3.6 million in cost-share funding for Rural Economic Development Initiative (REDI) communities and innovative projects that support the agency’s core missions. The submission deadline has been extended to Oct. 19 due to Hurricane Irma. Just a week ago, Hurricane Irma pummeled the Florida peninsula, causing severe flooding and wind damage across the 18 counties of the St. Johns River Water Management District. Since then, the district has been working with local governments and other stakeholders in their recovery efforts by reducing floodwater flows to the north, providing pumps and personnel to lessen localized flooding, and assessing damage from the storm. 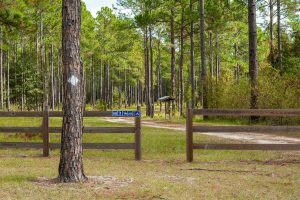 Two properties within the St. Johns River Water Management District’s service area are open to public recreation, including hunting. The openings were made as the district continues an in-depth assessment of recreational access points, levees, trails, and boat ramps. Days after Hurricane Irma’s storm surge has receded, the St. Johns River and other water bodies continue to rise in many areas, causing flooding headaches for local governments and their residents. The St. Johns River Water Management District continues to mitigate flooding impacts in support of local emergency operations as communities work to recover and restore services. The St. Johns River Water Management District today continued its support of local emergency operations by working to drain floodwaters from communities across northeast Florida and supporting its local government partners to reduce impacts from Hurricane Irma. 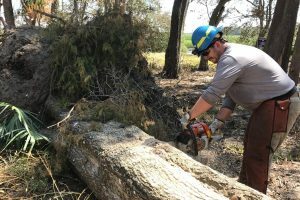 Staff members from the St. Johns River Water Management District on Wednesday began partnering with local government staff to survey damage from Hurricane Irma in Jacksonville. All lands owned by the St. Johns River Water Management District will remain closed to the public as staff continue to assess each property for safety and accessibility. 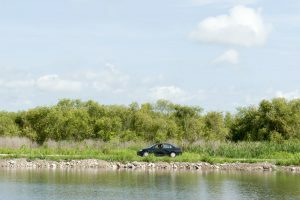 This includes the district’s Lake Apopka Wildlife Drive. 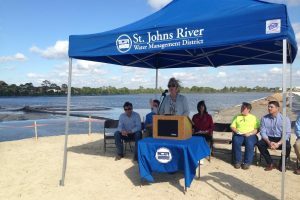 The St. Johns River Water Management District will reopen its offices for business on Wednesday. The St. Johns River Water Management District is assisting Flagler, Putnam and St. Johns counties by deploying pumps and staff to assist in recovery efforts from flooding caused by Hurricane Irma. 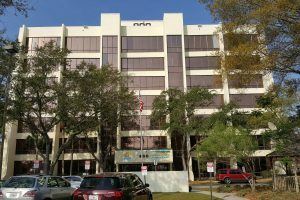 The St. Johns River Water Management District’s Governing Board will hold its September meeting at the district’s Maitland Service Center, where the board will discuss pressing agenda items, the tentative millage rate and budget adoption. The district will also hold the final budget adoption hearing, scheduled for Sept. 26, in Maitland. Massive Hurricane Irma brought dramatic flooding across Florida, from the Keys all the way to the St. Johns River in Jacksonville. 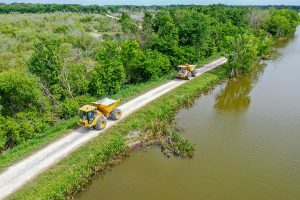 On Monday, the St. Johns River Water Management District began diverting water from the Upper St. Johns River Basin Project to reduce floodwaters flowing north, providing flood protection for people and property downstream, particularly in hard-hit Jacksonville. All St. Johns River Water Management District offices and public lands will remain closed through Tuesday as district staff recover from the impacts of Hurricane Irma and also inspect district facilities to ensure staff and visitor safety. 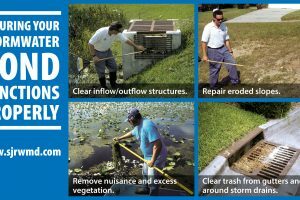 PALATKA, Fla., Sept. 8, 2017 — As Hurricane Irma approaches Florida this weekend, the St. Johns River Water Management District reminds property owners to be prepared for heavy rains by cleaning debris from storm drains and reporting clogged ditches to local governments in advance of the storm. The public also is encouraged to bookmark flooding information, water levels and other resources found on the district’s website at www.sjrwmd.com/localgovernments/flooding/. The district will postpone its monthly Governing Board meeting and tentative Fiscal Year 2017-2018 millage and budget hearing due to Hurricane Irma and the storm’s potential for impacts in the district’s 18-county area. Several other public meetings also are being postponed. The district will close its offices districtwide on Friday to give employees time to prepare their homes for Hurricane Irma. The district is closing all its public lands districtwide at 5 p.m. Thursday in advance of Hurricane Irma. The closure includes the Lake Apopka Wildlife Drive. The district is making preparations for Hurricane Irma. As in years past, the district’s flood control systems are prepared for a deluge, but there are limitations. 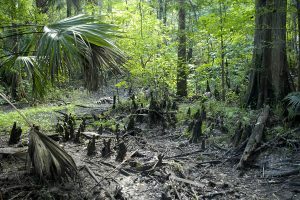 Scientists and engineers from the St. Johns River Water Management District and the University of Florida will hold a technical meeting Sept. 8 at Austin Cary Forest in Gainesville to share the scientific findings of the Collaborative Research Initiative on Sustainability and Protection of Springs (CRISPS). 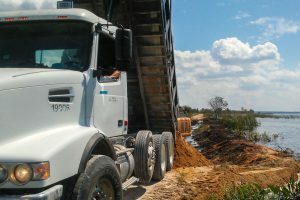 The district and Vulcan Materials Co. on Wednesday celebrated the completion of a well conversion project in Putnam County that will benefit Clay-Putnam minimum flows and levels (MFLs) while meeting the needs of the Grandin Sand Plant in producing vital construction materials for northeast Florida. 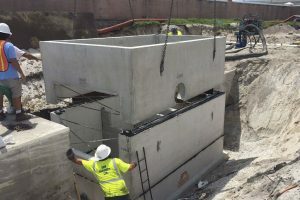 Brevard County installed a state-of-the art second-generation “baffle box” with a high-tech chamber that will capture and treat nitrogen and phosphorus before they can reach the Banana River Lagoon, which is part of the Indian River Lagoon. 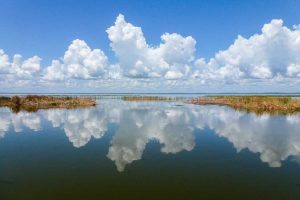 The St. Johns River Water Management District is a funding partner in this cost-share project, as well, as the Florida Department of Environmental Protection. 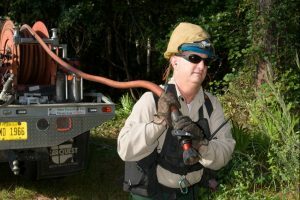 The St. Johns River Water Management District is conducting aerial herbicide treatments at several locations within its Lake Apopka North Shore. District staff are stationed to guide visitors in treatment areas adjacent to trails. Work is under way on a $500,000 project to replace old water mains in downtown Hawthorne, which will save millions of gallons of water currently lost through its antiquated distribution system. 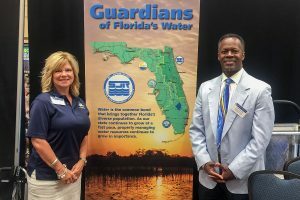 The St. Johns River Water Management District is fully funding the city’s project through its cost-share program to help Rural Economic Development Initiative (REDI) communities meet their water conservation and water resource development goals. 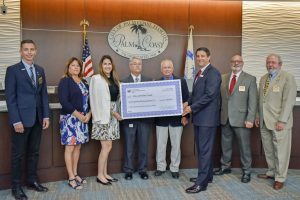 The district is providing $700,000 in cost-share funds to the city of Palm Coast for a project to rebuild aging flood control structures and allow for remote monitoring and control of the slide gates. The project will help protect residents and property in a 1,739-acre area of the city. 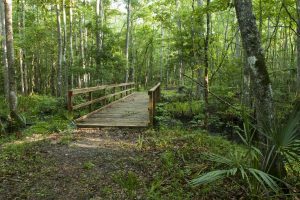 There are a lot of “dos” when visiting public lands owned and managed by the St. Johns River Water Management District — do take your time to enjoy natural Florida, do take drinking water and insect repellent, do hike or bike and take advantage of these unspoiled acres. 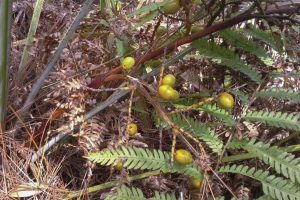 However, with saw palmetto berry season in full swing, the district wants to remind visitors of an important “don’t.” Harvesting saw palmetto berries is prohibited on public properties across Florida, including the district’s conservation lands. The district has launched a new and improved website featuring a more contemporary look, streamlined pages and improved navigability. The district has been awarded the Distinguished Budget Presentation Award for its fiscal year 2016-2017 budget from the Government Finance Officers Association (GFOA) of the United States and Canada. Mary-Lou Pickles, director of the district’s Office of Financial Services and the district’s former budget director, also was recognized. 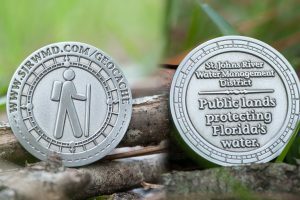 Modern day adventurers may score a new commemorative coin by geocaching on St. Johns River Water Management District lands this summer, just in time for International Geocaching Day on Aug. 19. District staff recently met with Orange County residents to talk about wildfire safety and how they can work together to reduce the risk of fire damage to their homes through prescribed fire. The district is providing $2 million in cost-share funds to Putnam County toward expansion of its East Putnam Regional Wastewater Treatment Facility. The project will significantly reduce nutrient loading to Dunns Creek and the St. Johns River. 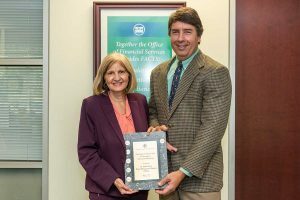 The district has been awarded the Certificate of Achievement for Excellence in Financial Reporting for its fiscal year 2015-2016 Comprehensive Annual Financial Report (CAFR) from the Government Finance Officers Association (GFOA) of the United States and Canada. District Finance Director Greg Rockwell also was recognized. Soggy lawns might make drought conditions from eight weeks ago feel like a distant memory, yet areas within the district are still recovering from the spring’s dry spell. The district is conducting a 149-acre prescribed fire today at Crescent Lake Conservation Area in Volusia County, northwest of the group campsite. The purpose of the prescribed fire is to promote native species and ecological diversity. Visitors to the St. Johns River Water Management District’s Lake Apopka North Shore should expect larger-than-usual crowds this weekend. 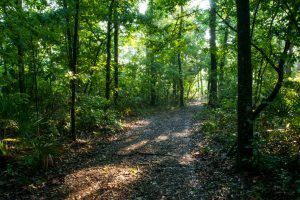 Portions of the property’s nonmotorized loop trail are part of the mapped route for the 2017 Magnolia Park Forest Run. The district is accepting applications for its Blue School Grant Program. In its second year, the educational grant program offers up to a total of $20,000 for teachers working to promote water resource protection through hands-on learning opportunities. Two informational public meetings will be held in August to present information about the Black Creek Water Resource Development (WRD) Project to interested residents and stakeholders. Ensuring that central Florida has the water it needs is at the core of the Central Florida Water Initiative. A 120-acre wildfire reported at Seminole Ranch Conservation Area on July 20 is fully contained. 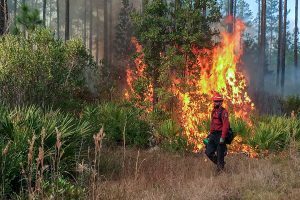 The district is responding to a wildfire reported on the Seminole Ranch Conservation Area (at the convergence of Orange, Brevard, Volusia and Seminole counties). 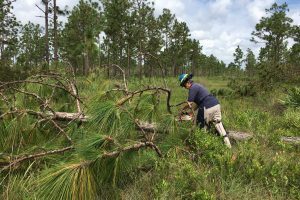 The district conducted a 217-acre prescribed fire July 12 at Pellicer Creek Conservation Area in Flagler County, west of U.S. 1 to maintain a healthy ecosystem and to reduce fuels that can cause wildfires. 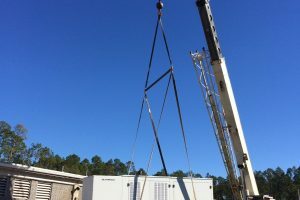 A project to provide recharge to the Floridan aquifer using excess water from flood-prone Black Creek received a nod from the district’s Governing Board Tuesday, which directed its executive director to negotiate with the top-ranked design/engineering firm to get the project off the ground. The district’s Governing Board Tuesday approved a tentative budget that reduces the millage rate for taxpayers for a fifth consecutive year while continuing to provide significant funds for programs and projects to ensure sustainable water resources, increase water conservation and protect water quality in springs and other priority water bodies. Recent wet weather has brought an end to drought conditions, as well as indications of rebounding aquifer levels, within the district. A report outlining hydrological conditions was presented at the district’s July Governing Board meeting. 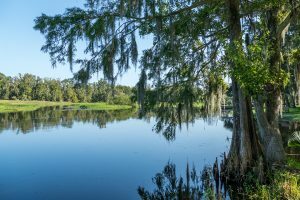 The Central Florida Water Initiative (CFWI) is developing innovative projects to meet the growing water needs of the five-county Central Florida region while also protecting the region’s water resources. A local memorial park will save 215 gallons of water per day after reclaimed water infrastructure for irrigation is installed. The St. Johns River Water Management District contributed $168,261 to the recently completed project at Woodlawn Memorial Park in Orange County. 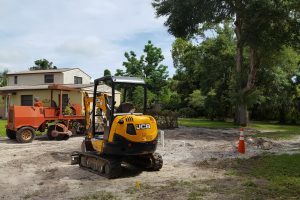 Residents of the Breeze Swept subdivision in Rockledge have begun making the switch from septic to sewer, thanks to a cost-share project designed to reduce septic tank pollution in the Indian River Lagoon. 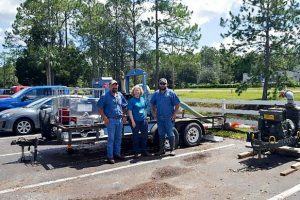 A recently completed project at a central Florida RV park and campground will help achieve water quality improvements for Lake Apopka and springs of the Wekiva system. 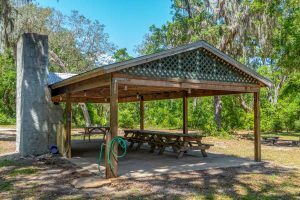 The St. Johns River Water Management District contributed $34,425 to the project at Orange Blossom KOA in Orange County, which dismantled an old wastewater treatment plant and connected the campground to a central sewer system. 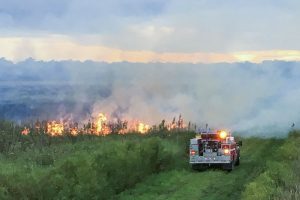 On June 26, lightning ignited a wildfire on a St. Johns River Water Management District property west of Interstate 95 and south of State Road 520 in Brevard County. 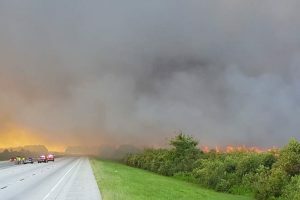 A wildfire continues to burn on a St. Johns River Water Management District property west of Interstate 95 and south of State Road 520 in Brevard County. 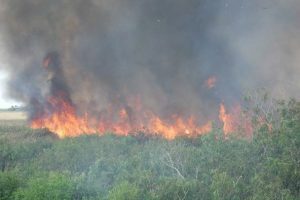 A wildfire is burning on a district property west of Interstate 95 and south of State Road 520 in Brevard County. Approximately 800 acres burned Monday evening. District staff plan to burn out the entire 5,000-acre property on Tuesday morning. A wildfire has been reported at River Lakes 8, a St. Johns River Water Management District property south of State Road 520 and west of Interstate 95. The blaze was started by a lightning strike. 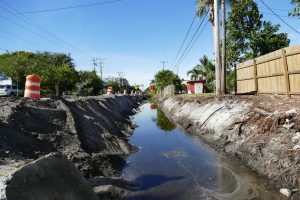 Only four months after dredging began, approximately 125,000 cubic yards of muck have already been pumped from the Eau Gallie River in Melbourne. The river is a tributary of the Indian River Lagoon. 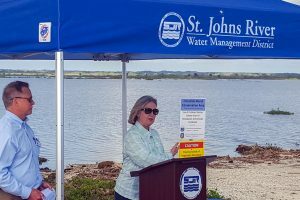 Annual reporting conducted by the St. Johns River Water Management District shows that total water use was approximately two percent above the 10-year average, and was 14 percent higher than 2015, while total population increased about two percent. The district’s 2016 Survey of Annual Water Use was presented at the district’s June Governing Board meeting. 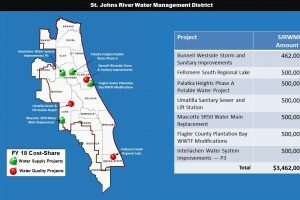 Forty-three projects will share in approximately $21.3 million from the St. Johns River Water Management District for construction of water supply and water conservation, water quality improvement, flood protection and natural systems restoration projects. 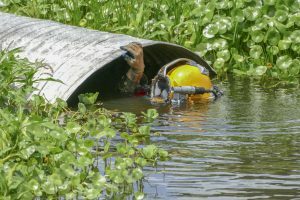 St. Johns River Water Management District maintenance crews are using an innovative technique to slash culvert repairs by as much as 80 percent. As a result of recent rainfall, the St. Johns River Water Management District is lifting the districtwide burn ban on campfires. Campfires on district lands are still prohibited by the burn bans issued by the following counties: Putnam, Flagler, Volusia, Orange, Osceola and Indian River. Gov. 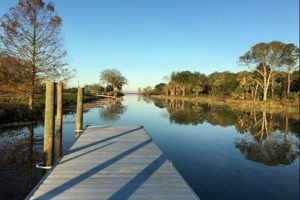 Rick Scott has appointed Janet Price of Fernandina Beach to the St. Johns River Water Management District Governing Board, filling a vacant seat that represents the St. Marys River Basin and the adjacent coastal area. The appointment takes effect immediately and runs through March 1, 2018. Built on the concept of collaboration, the Central Florida Water Initiative (CFWI) works with the area’s 83 utilities to scale water conservation efforts and promote alternative water supplies for a growing population. Between 2014 and 2016 the St. Johns River Water Management District has realized a net decrease in permitted groundwater of approximately 3.5 million gallons of water per day (MGD). The reduction is a result of several factors but primarily changes in demonstrated need by permit holders. 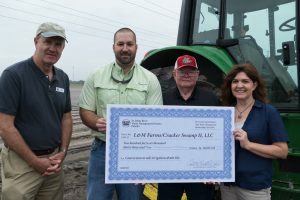 The St. Johns River Water Management District is accepting applications through July 28 from farmers interested in participating in cost-share funding for agricultural projects that promote water conservation and improve water quality in area waterways. Up to $1.5 million is available to support the efforts. 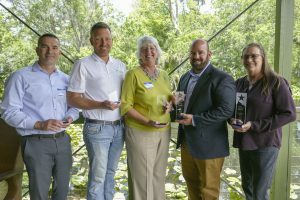 Florida Water Star SM presented six awards to local organizations and individuals for their work to further water conservation. 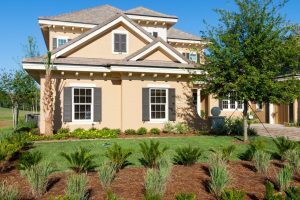 Developed by the St. Johns River Water Management District and launched in 2007, the Florida Water Star program provides water conservation certification for homes, entire communities and commercial developments. As hydrologic trends reflect below-average rainfall across the district, the district Governing Board approved expanding the current Water Shortage Warning Order to include all areas within the district’s 18-county jurisdiction. The St. Johns River Water Management District’s Governing Board is holding its April monthly meeting offsite at the Eustis City Commission Chambers April 11. While board meetings are routinely held at district headquarters in Palatka, the board holds periodic off-site meetings to be more accessible to the public and enhance transparency in district business. The number of certifications being sought for water conservation increased 200 percent in 2016. 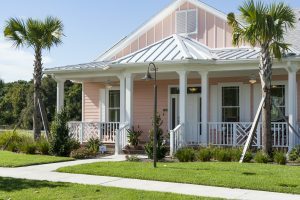 Developed by the St. Johns River Water Management District and launched in 2007, the Florida Water StarSM program provides water conservation certification for homes, entire communities and commercial developments. Governor Rick Scott announced one appointment and one reappointment to the Governing Board of the St. Johns River Water Management District. Susan Dolan, 51, of Longwood, is the director of community affairs for Waste Pro of Florida, Inc. She succeeds Maryam Ghyabi, whose term ended in March 2017. The appointment takes effect immediately and runs through March 1, 2021. 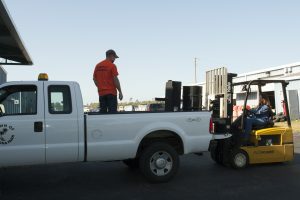 Putnam County schools, the city of Bunnell and the town of Pomona Park are benefitting from thousands of dollars of surplus items from the St. Johns River Water Management District. 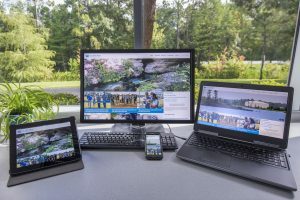 These Rural Economic Development Initiative (REDI) community partners were notified last week that they will receive a variety of computer monitors, PCs and vehicles from the district’s program to donate surplus equipment to economically disadvantaged communities. 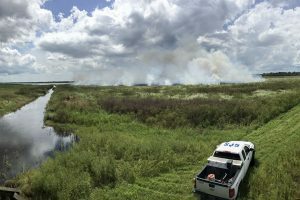 St. Johns River Water Management District land managers and partnering agencies are burning interior pockets within a wildfire that began Wednesday afternoon on the Seminole Ranch Conservation Area. When finished by nightfall on Thursday, the total area burned within the wildfire is expected to be more than 6,800 acres. A wildfire is reported on St. Johns River Water Management District property and a second fire is burning toward district land. One fire is burning on private land and heading toward Canaveral Marshes Conservation Area southeast of the St. Johns River channel. 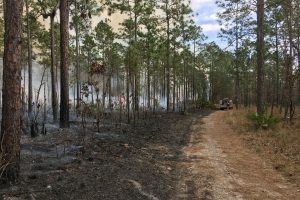 The Florida Forest Service has plowed a protective fire line on district property and district staff have begun an operation to burn the fire out. Smoke is impacting nearby State Road 520. 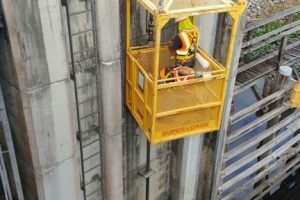 A large-scale renovation of the Moss Bluff Lock and Dam in Marion County is scheduled to begin in mid-April and work is already underway to prepare the site. 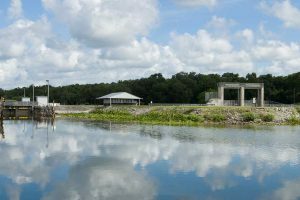 The St. Johns River Water Management District operates and maintains the structure, which serves as a navigational aid and flood control structure on the Ocklawaha River. 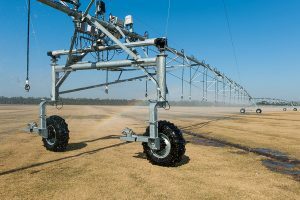 The St. Johns River Water Management District Governing Board on Tuesday approved the ranking of projects that will share in $1.5 million in Tri-County Agricultural Area (TCAA) Ag Cost-Share Program funds for water conservation and nutrient reduction by ag operations. Proposed projects would result in an estimated 266 million gallons of water conserved each year and an estimated reduction of 6,916 pounds per year of total nitrogen and 1,426 pounds per year of total phosphorus. 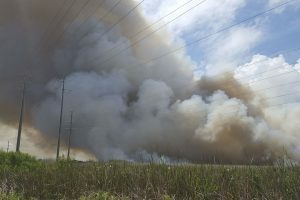 A wildfire near Canaveral Marshes Conservation Area has been extinguished but a second fire at Seminole Ranch Conservation Area has grown to 450 acres, according to St. Johns River Water Management District officials. 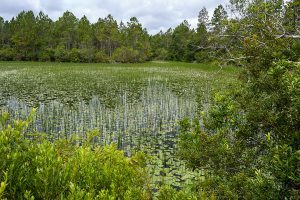 How are we protecting Florida’s waterbodies? District explains. 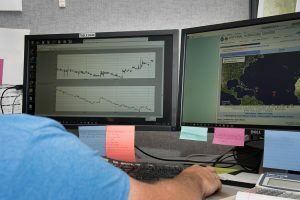 In the second of a series of informational presentations to the Governing Board and the public, St. Johns River Water Management District staff Tuesday worked to demystify one of the most complex tools used by the agency to strike the necessary balance between nature’s needs and people’s needs for water — the Minimum Flows and Levels (MFLs) program. MFLs define the limits at which further water withdrawals would be significantly harmful to the water resources or ecology of an area. 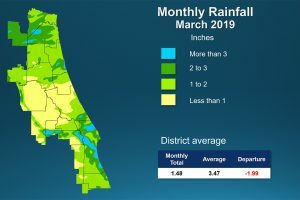 The St. Johns River Water Management District Governing Board approved a Water Shortage Warning Order as hydrologic trends reflect below-average rainfall across parts of the district. This comes after several months of proactive messaging by the district to keep the public well-informed about the potential for prolonged drought. The order further aligns water management districts, which each continue to monitor weather conditions to best inform decisions on water management across the state. The St. Johns River Water Management District is accepting applications March 15–April 13 to share in $25 million in cost-share funding for water supply, water quality, natural systems and flood protection construction projects. An informational workshop will be held March 16 at 2 p.m. at district headquarters, 4049 Reid St., Palatka. 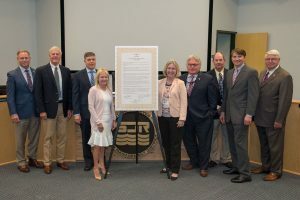 For the fourth consecutive year, the St. Johns River Water Management District’s Governing Board has approved a proclamation designating April as Springs Protection Awareness Month. The annual designation helps increase awareness about the importance of Florida’s springs and encourages residents and stakeholders to participate in the protection of springs. 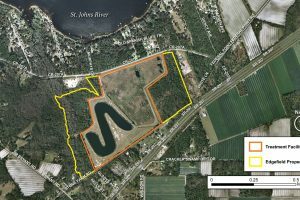 The St. Johns River Water Management District’s Governing Board voted Tuesday to finalize the transfer of the 948-acre Gemini Springs Addition property to Volusia County. The St. Johns River Water Management District is holding a public workshop to provide information and receive public comments on proposed minimum flows and a proposed prevention strategy for Silver Springs in Marion County. 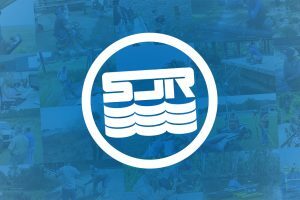 Updates on land management and recreation activities will be discussed March 15 during the St. Johns River Water Management District’s Northern Recreational Public Meeting. St. Johns River Water Management District staff recently met with residents in Orange and Brevard counties to talk about wildfire safety and how they can work together to reduce the risk of fire damage to their homes through prescribed fire. The meetings are part of the residents’ ongoing participation in the national Firewise Communities fire prevention program for homeowners. The St. Johns River Water Management District is partnering with the Gainesville chapter of the National Wild Turkey Federation (NWTF) and the Florida Fish and Wildlife Conservation Commission for a youth turkey hunt March 11-12 at the River Styx portion of Longleaf Flatwoods Reserve and the north tract of Newnans Lake Conservation Area in Alachua County. 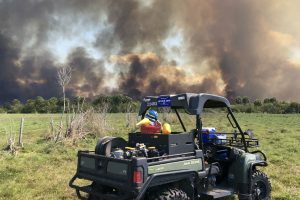 The district is responding to wildfire reported on the Hal Scott Regional Preserve and Park in Orange County and on the Seminole Ranch Conservation Area (at the convergence of Orange, Brevard, Volusia and Seminole counties). 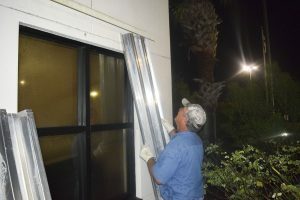 A 43-year-old office building on University Boulevard North in Jacksonville has received an energy and water makeover and is poised to receive the first-ever Florida Water StarSM certification for existing commercial buildings within the St. Johns River Water Management District. District staff expect to issue the certification this week to Custom Builders, which overhauled the seven-story office building to significantly reduce water use. The St. Johns River Water Management District is conducting two prescribed burns. 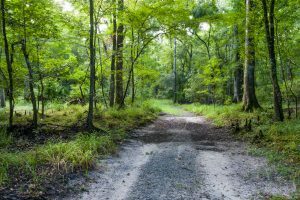 The first is at the Sunnyhill Restoration Area and the second is at the Ocklawaha Prairie Restoration Area. Both burns are in Marion County. The purposes of the burns are to reduce hazardous fuel accumulations and the maintenance of fire-dependent ecosystems. Scientists and engineers from the district and the University of Florida (UF) are holding a technical meeting March 10 at district headquarters in Palatka to discuss the progress of the district’s Springs Protection Initiative science program. The meeting is a semi-annual event that includes the lead researchers from the six collaborative workgroups involved in the three-year scientific investigation. Nothing can stop the St. Johns River Water Management District from cleaning up the Eau Gallie River – except for possibly frolicking manatees. The district is assisting the Florida Forest Service with a 227-acre prescribed burn at the Little Big Econ State Forest in Seminole County. 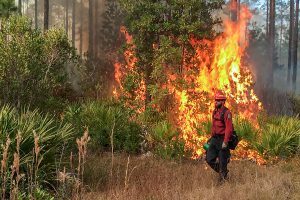 The district is conducting a 12,000-acre prescribed fire on Wednesday at Blue Cypress Conservation Area in Indian River County. The purpose of the controlled burn is to maintain a healthy ecosystem and to reduce fuels that can cause wildfires. The district is conducting a 436-acre prescribed burn Tuesday at the Orange Creek Restoration Area in Alachua County, a mile north of the parking area on County Road 318. The purpose of the burn is to reduce hazardous fuel loads and maintain fire-dependent ecosystems. 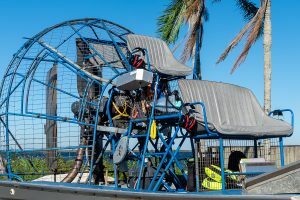 Visitors and outdoor enthusiasts have a new way to explore the Lake Apopka North Shore. Representatives from several community organizations and governments joined the district Thursday to celebrate the opening of a new recreational facilities at Lake Apopka North Shore. PALATKA, Fla., Feb. 22, 2017 — The St. Johns River Water Management District is holding a special workday Saturday, Feb. 25, to remove invasive air potato from its Deep Creek Conservation Area’s Edgefield tract in East Palatka. The workday is being held as an observance of National Invasive Species Awareness Week 2017, which is Feb. 27 through March 3. 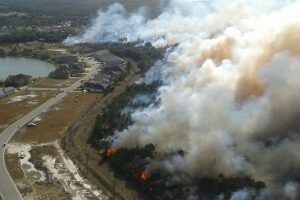 PALM BAY, Fla., Feb. 17, 2017 — Lake Lawton Recreation Area in Brevard County is closed until further notice as St. Johns River Water Management District and partnering agencies manage a wildfire that ignited Wednesday. PALM BAY, Fla., Feb. 16, 2017 — The St. Johns River Water Management District, Florida Department of Environmental Protection, state and local elected officials, and Indian River Lagoon protection advocates celebrated the commencement of muck dredging from the Eau Gallie River today at Ballard Park in Melbourne. 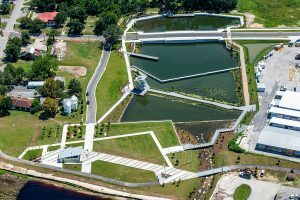 MAITLAND, Fla., Feb. 15, 2017 — The St. Johns River Water Management District is hosting a ribbon cutting to celebrate the opening of new recreational facilities at the Lake Apopka North Shore. 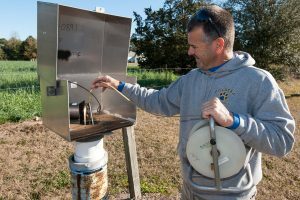 PALATKA, Fla., Feb. 14, 2017 — Water use from approximately 96 percent of permitted groundwater allocations across 18 counties is measured and reported to the St. Johns River Water Management District and verified by state-of-the-art science. 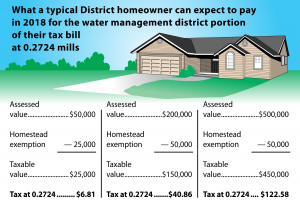 District staff presented an overview of the district’s Consumptive Use Permitting (CUP) program and methodologies used to estimate the total water use within the district at Tuesday’s board meeting, the first of a series of informational presentations to correct recent published inaccuracies. 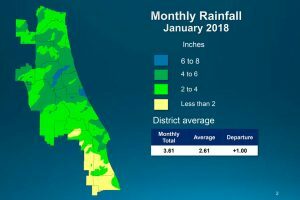 PALATKA, Fla., Feb. 14, 2017 — Over the past 12 months, rainfall has remained below average across the St. Johns River Water Management District, resulting in a districtwide rainfall deficit of almost 8 inches. A full report outlining rainfall totals was presented at the district’s February Governing Board meeting Tuesday. 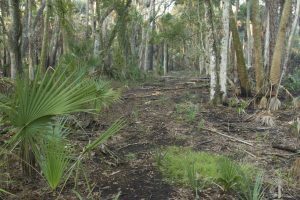 PALM BAY, Fla., Feb. 14, 2017 — A land management update and the Upper St. Johns River Basin project are among the items to be discussed Feb. 16 during the St. Johns River Water Management District’s Southern Recreational Public Meeting. MAITLAND, Fla., Feb. 6, 2017 — The St. Johns River Water Management District is hosting a public workshop for outside vendors and companies to present a brief overview of treatment technologies in the removal of total phosphorus from Lake Jesup’s water column. Preregistration to present at the workshop is required by Feb. 20. PALATKA, Fla., Feb. 1, 2017 — Manatee protection is getting a boost today when new water resource protection rules for Ponce de Leon Springs, set by the St. Johns River Water Management District, become effective. In mid-December 2016, the district’s Governing Board approved rule amendments to adopt minimum flows for the spring in Volusia County. MAITLAND, Fla., Jan. 24, 2017 — Known for their enticing wildlife habitats, two of the St. Johns River Water Management District’s properties are being featured during the Space Coast Birding and Wildlife Festival. 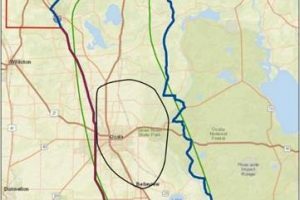 The governing boards of the St. Johns River and Suwannee River water management districts on Jan. 17 jointly approved a 20-year plan to protect the sustainability of water supplies and identify potential future water supply sources. 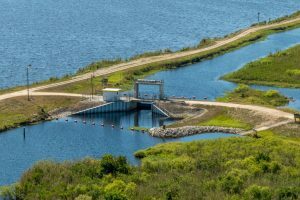 Approval of the North Florida Regional Water Supply Plan completes a four-year public process and the first-ever joint planning effort between the two agencies and the Florida Department of Environmental Protection (DEP). 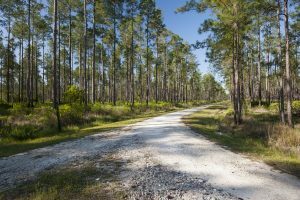 PALATKA, Fla., Jan. 12, 2017 — Negotiations on a proposed land exchange on the Bull Creek Wildlife Management Area have been called off. 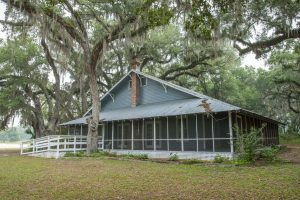 The St. Johns River Water Management District and the landowner were unable to reach a suitable agreement. The item will not go before the Governing Board in February. The informational public meeting scheduled for Jan. 31 on the potential exchange is also being canceled. Information on the property can be found here. PALATKA, Fla., Jan. 10, 2017 — The governing boards of the St. Johns River and Suwannee River water management districts are meeting Jan. 17 to jointly consider the North Florida Regional Water Supply Plan. The plan looks at the sustainability of water supplies 20 years into the future and identifies potential future water supply sources. The boards’ consideration of the plan is the culmination of a four-year public process that included 36 Stakeholder Advisory Committee (SAC) meetings, more than 50 other stakeholder meetings and two public workshops. PALM BAY, Fla., Dec. 29, 2016 — The St. Johns River Water Management District is conducting a 700-acre prescribed fire today at Kenansvilee Lake in Indian River County. The purpose of the controlled burn is to reduce fuel loads that contribute to wildfires. 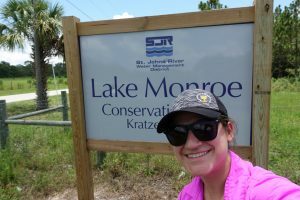 PALATKA, Fla., Dec. 20, 2016 — Three St. Johns County schoolteachers are receiving grant funding from the St. Johns River Water Management District’s new Blue School Grant Program for projects to enhance student development in science, technology, engineering and math (STEM) related topics. The program offers financial support for teachers working to promote water resource protection through hands-on learning opportunities. MAITLAND, Fla., Dec. 16, 2016 — The North Shore Trailhead, located within the St. Johns River Water Management District’s Lake Apopka North Shore, will temporarily close to accommodate bridge repairs within the property. MAITLAND, Fla., Dec. 15, 2016 — The St. Johns River Water Management District is partnering with the National Audubon Society for its 117th Annual Christmas Bird Count. Several district properties will host birdwatchers during the nationwide event. PALM BAY, Fla., Dec. 14, 2016 — The St. Johns River Water Management District, the U.S. Army Corps of Engineers and the Florida Department of Environmental Protection celebrated the rehabilitation of a water control structure at Taylor Creek Reservoir that provides flood protection and water supply benefits to Brevard and Osceola counties. MAITLAND, Fla., Dec. 14, 2016 — During three days in January, birds will take center stage at the Lake Apopka Wildlife Festival and Birdapalooza. 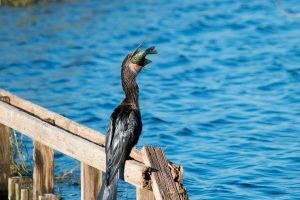 Registration is now open for a variety of activities during the festival, including tours of the St. Johns River Water Management District’s Lake Apopka North Shore, a popular birding destination. PALATKA, Fla., Dec. 13, 2016 — The St. Johns River Water Management District Governing Board Tuesday approved moving forward with proposed rule amendments to adopt minimum flows for DeLeon Springs in Volusia County and amend minimum water levels for Lake Cowpen in Putnam County. 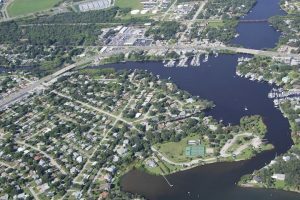 PALATKA, Fla., Dec. 13, 2016 — The St. Johns River Water Management District Governing Board on Tuesday approved the ranking of projects that will share in $5 million in cost-share funds to benefit water resources in Rural Economic Development Initiative (REDI) communities and for projects that use innovative technology to provide data supporting future permitting and full-scale implementation of alternative water supplies. PALATKA, Fla., Dec. 13, 2016 — Data compiled by the St. Johns River Water Management District shows a lack of rainfall during November which left much of Central Florida as one of the driest the areas for that month. 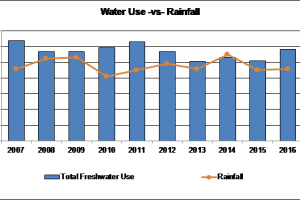 A full report outlining rainfall totals for November and the previous 12 months was presented at the district’s December Governing Board meeting Tuesday. 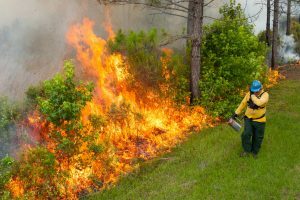 PALATKA, Fla., Dec. 9, 2016 — The St. Johns River Water Management District is conducting a 786-acre controlled burn Friday at the Bayard Conservation Area in Clay County. The purpose of the burn is to reduce fuels and improve the health of the forest. PALATKA, Fla., Dec. 8, 2016 — The St. Johns River Water Management District is conducting a 160-acre prescribed burn Thursday at the Lochloosa Wildlife Conservation Area near the intersection of County Road 325 and County Road 346 in Alachua County. The purpose of the burn is to prepare the site for reforestation into longleaf pine and to reduce fuel loads. PALATKA, Fla., Dec. 8, 2016 — The St. Johns River Water Management District is partnering with the Gainesville chapter of the National Wild Turkey Federation (NWTF), the Florida Fish and Wildlife Conservation Commission for a youth deer hunt Dec. 9-11 at the River Styx portion of Longleaf Flatwoods Reserve and the north tract of Newnans Lake Conservation Area in Alachua County. MAITLAND, Fla., Dec. 5, 2016 — Work is nearly complete on upgrades to the city of Umatilla’s wastewater system, which includes about 17,500 linear feet of gravity sewer line and 65 manholes. 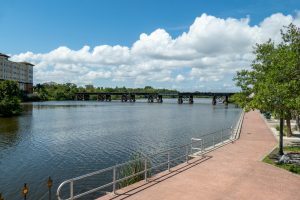 The St. Johns River Water Management District committed $500,000 to this phase of the project, which complements other projects meant to improve the city’s wastewater infrastructure. 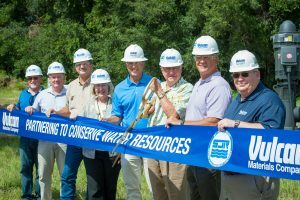 PALATKA, Fla., Dec. 2, 2016 — The St. Johns River Water Management District, with the city of Daytona Beach, Volusia County and the Florida Forest Service, celebrated Friday the completion of a new weir across Tiger Bay Canal that enhances recharge to the aquifer system, benefits nearby Indian Lake and decreases stormwater discharges to the Tomoka/Halifax river system. MAITLAND, Fla., Dec. 2, 2016 — Work is nearly complete on the installation of 1.5 miles of reclaimed water main within the city of Apopka. 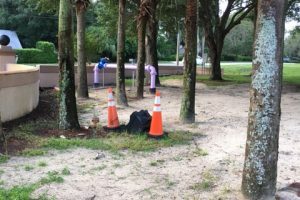 The St. Johns River Water Management District provided $231,254 for the project, which complements other reclaimed water projects in the city. PALM BAY, Fla., Nov. 30, 2016 — The St. Johns River Water Management District is conducting a 53-acre prescribed fire today at the Buck Lake Conservation Area in Brevard County. 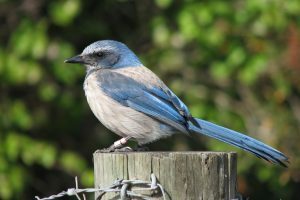 The purpose of the controlled burn is to enhance scrubby flatwoods for the Florida scrub jay and other wildlife species. 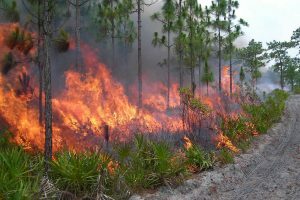 PALM BAY, Fla., Nov. 18, 2016 — The St. Johns River Water Management District is conducting a 1,000-acre prescribed fire today at the Blue Cypress Conservation Area in Indian River County. The purpose of the controlled burn is to reduce organic fuels in an area north of the property’s boat ramp. 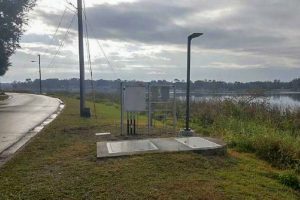 PALM BAY, Fla., Nov. 17, 2016 — St. Johns River Water Management District researchers will be safer while checking the status of water quality monitoring equipment in the Indian River Lagoon, thanks to new platforms the agency is constructing at five locations. PALATKA, Fla., Nov. 15, 2016 — The St. Johns River Water Management District’s Governing Board on Tuesday re-elected John A. Miklos of Orlando to serve as board chairman for a fourth year. 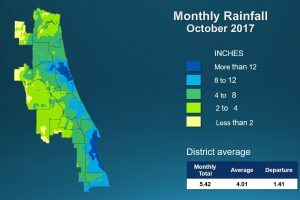 PALATKA, Fla., Nov. 15, 2016 — Despite experiencing above average rainfall across most of the St. Johns River Water Management District during October, the district continues to see a deficit when compared to a 12-month average. A full report outlining rainfall totals for October and the previous 12 months was presented at November’s Governing Board meeting. 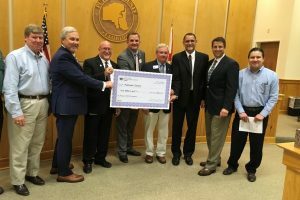 PALATKA, Fla., Nov. 15, 2016 — The St. Johns River Water Management District Governing Board Tuesday approved the rankings of projects that will share $1.5 million in agricultural cost-share funds to assist farmers, growers and ranchers in water conservation projects that conserve water and result in nutrient loading reductions. 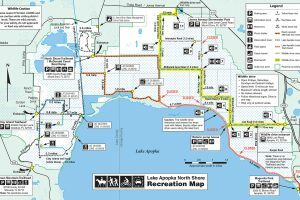 MAITLAND, Fla., Nov. 14, 2016 — Visitors to the St. Johns River Water Management District’s Lake Apopka North Shore should expect additional bicycle traffic on western segments of the non-motorized loop trail on select dates. 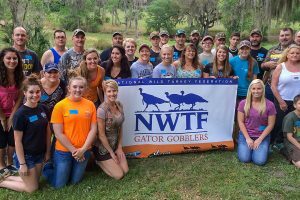 PALATKA, Fla., Nov. 10, 2016 — The St. Johns River Water Management District is partnering with the Gainesville chapter of the National Wild Turkey Federation (NWTF) and the Florida Fish and Wildlife Conservation Commission for a youth deer hunt Nov. 11-13 at the River Styx portion of Longleaf Flatwoods Reserve and the north tract of Newnans Lake Conservation Area in Alachua County. MAITLAND, Fla., Nov. 10, 2016 — The St. Johns River Water Management District’s Sunnyhill Restoration Area in Marion County will host veteran’s group Operation Outdoor Freedom for a guided deer hunt Nov. 15-17. 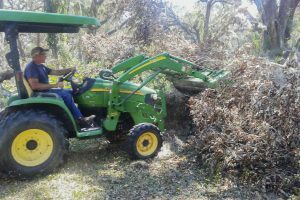 PALATKA, Fla., Nov. 9, 2016 — All St. Johns River Water Management District lands are open once again to the pubic after extensive cleanup following Hurricane Matthew last month. 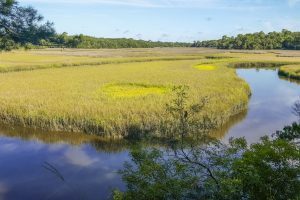 The Fort Drum Marsh Conservation Area reopened late last week in time for the start of hunting season, and Pellicer Creek Conservation Area reopened Tuesday. MAITLAND, Fla., Nov. 7, 2016 — The St. Johns River Water Management District’s popular wildlife drive at Lake Apopka is open on Veterans Day, Friday, Nov. 11. PALATKA, Fla., Nov. 7, 2016 — The St. Johns River Water Management District is holding a rule development workshop to provide information and receive public comments on proposed rule amendments to adopt minimum flows for DeLeon Springs in Volusia County and amend minimum water levels for Lake Cowpen in Putnam County. PALATKA, Fla., Nov. 4, 2016 — The stakeholder advisory committee of the North Florida Regional Water Supply Partnership Wednesday unanimously voted to support and recommend approval of the draft regional water supply plan for north Florida to the governing boards of the St. Johns River and Suwannee River water management districts. The committee has served as an advisory body since June 2012 to offer viewpoints from stakeholder groups to the St. Johns River and Suwannee River water management districts and the Florida Department of Environmental Protection to help address the region’s water supply challenges. As its final action, the committee then voted to dissolve itself, having completed the tasks for which it was created. MAITLAND, Fla., Nov. 1, 2016 — Reset your sprinklers when you reset your clocks to mark the end of daylight saving time at 2 a.m. Sunday, Nov. 6. 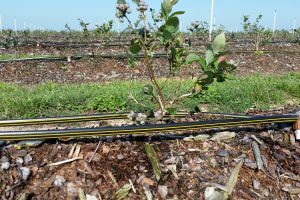 The change coincides with a shift in watering restrictions across the St. Johns River Water Management District, designed to ensure the efficient use of water for landscape irrigation. 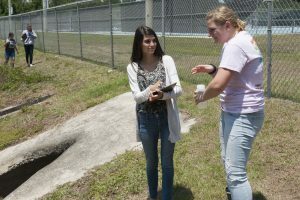 PALATKA, Fla., Oct. 31, 2016 — The St. Johns River Water Management District is launching a new educational grant program to enhance student development in science, technology, engineering and math (STEM) related topics. The Blue School Grant Program offers financial support for teachers working to promote water resource protection through hands-on learning opportunities. PALATKA, Fla., Oct. 27, 2016 — The stakeholder advisory committee of the North Florida Regional Water Supply Partnership is holding its final meeting Wednesday, Nov. 2. The agenda includes a proposed consensus recommendation in support of the draft North Florida Regional Water Supply Plan, which was recently released for public review and comment. The committee will also consider a motion to dissolve itself, having completed the tasks for which it was created. 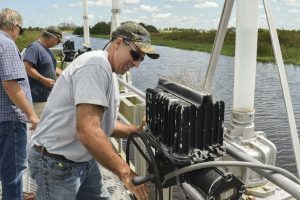 PALM BAY, Fla., Oct. 24, 2016 — St. Johns River Water Management District scientists have installed four water quality monitors in the headwaters of the St. Johns River to help the district best manage the black water systems and marshes of the waterway. 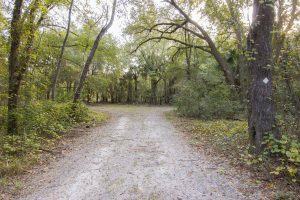 MAITLAND, Fla., Oct. 20, 2016 — The St. Johns River Water Management District is opening 2.5 miles of new trails on the popular district-owned Lake Apopka Wildlife Drive. The new segments will help alleviate traffic bottlenecks. PALM BAY, Fla., Oct. 19, 2016 — An additional $1.5 million for restoration work is set to benefit the Indian River Lagoon. 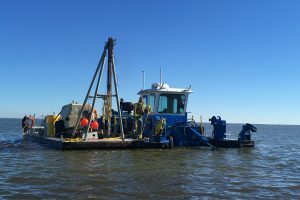 The Florida Inland Navigation District (FIND) is allocating the funding through its cooperative assistance program for the dredging of muck from the Eau Gallie River. This additional money raises the total FIND contribution to $3.9 million. Other funding partners include DEP, which is providing $20 million approved by the Legislature in 2014 and 2015, and the city of Melbourne, which contributed $50,000 for the initial feasibility study. 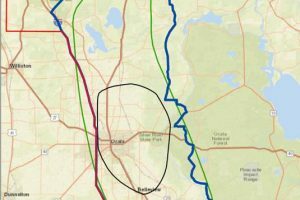 PALATKA, Fla., Oct. 17, 2016 — The St. Johns River and Suwannee River water management districts are conducting two public workshops to discuss the draft North Florida Regional Water Supply Plan and to take public comment. PALATKA, Fla., Oct. 14, 2016 — Only a week ago, Hurricane Matthew skirted the east coast of Florida, causing severe flooding and damage from strong winds. 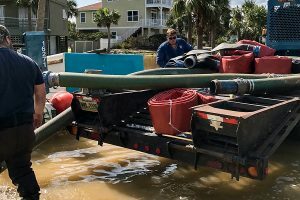 Since then, the St. Johns River Water Management District has been working with local governments and other stakeholders in their recovery efforts by providing pumps and personnel to lower floodwaters and assess damage from the storm. 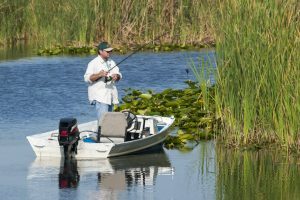 PALM BAY, Fla., Oct. 13, 2016 — A land management update, the Upper St. Johns River Basin project and the Fellsmere Water Management Area Recreation Plan are among the items to be discussed Oct. 20 during the St. Johns River Water Management District’s southern recreational area public meeting. 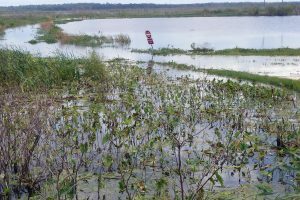 PALM BAY, Fla., Oct. 13, 2016 — One of the largest flood control and marsh restoration projects in the world proved itself once again during Hurricane Matthew. PALATKA, Fla., Oct. 12, 2016 — Fifteen staff members from the St. Johns River Water Management District partnered with local government staff to canvas four north Florida counties this week to survey damage from Hurricane Matthew. PALATKA, Fla., Oct. 11, 2016 — In support of post-hurricane recovery efforts, the St. Johns River Water Management District (SJRWMD) has authorized certain flood relief measures for local governments and property owners who need to pump or divert floodwaters. The Governing Board today approved an emergency order that also gives permit holders additional time to comply with permit conditions that will come due after Oct. 5. The board’s action extends the duration of permits that expire between Oct. 5 and Nov. 2. MAITLAND, Fla., Oct. 11, 2016 — As Hurricane Matthew traveled Florida’s east coast, the St. Johns River Water Management District’s 18-county service area received widespread rain, with the highest rainfall totals experienced in the northern coastal areas of the state. A full report of the storm’s impacts before and immediately after the storm was presented at today’s Governing Board meeting. MAITLAND, Fla., Oct. 11, 2016 — The St. Johns River Water Management District’s Governing Board approved two water permit renewals today that reflect a decreased allocation of approximately 197 million gallons of water per year in central Florida. District staff worked with the cities of Belleview and Maitland on efforts to implement water-saving measures, including greater use of reclaimed water, system leak detection and water conserving rate structures, resulting in significant reductions to their consumptive use permits. PALATKA, Fla., Oct. 10, 2016 — As the post-hurricane recovery continues in northeast and central Florida coastal counties, the St. Johns River Water Management District today reopened its offices as well as nearly 20 conservation areas. District employees have worked more than 400 staff hours over the recovery period, inspecting levees, structures and public lands. Staff are also assisting local governments in their work to alleviate flooding. MAITLAND, Fla., Oct. 9, 2016 — After completing inspections and cleanup, the St. Johns River Water Management District’s Lake Apopka Wildlife Drive will reopen on Monday, Oct. 10. The nonmotorized Lake Apopka Loop Trail will remain closed as land managers continue cleanup efforts in the wake of Hurricane Matthew. PALATKA, Fla., Oct. 9, 2016 — The St. Johns River Water Management District continued recovery efforts today in the Jacksonville Beach area in the wake of Hurricane Matthew. 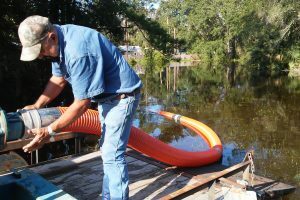 PALATKA, Fla., Oct. 8, 2016 — The St. Johns River Water Management District is assisting state and local governments with recovery efforts in the wake of Hurricane Matthew. PALATKA, Fla., Oct. 6, 2016 — Due to the potential effects of Hurricane Matthew, navigation through the Burrell Lock, Moss Bluff Lock and the Apopka Lock and Dam will be temporarily suspended as of noon today (Oct. 6). 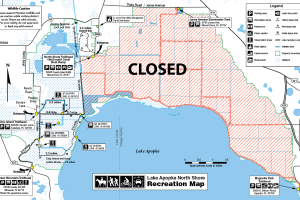 MAITLAND, Fla., Oct. 6, 2016 — Effective immediately, the Lake Apopka Wildlife Drive, and all lands owned by the St. Johns River Water Management District, are closed to public access and recreation. PALATKA, Fla., Oct. 5, 2016 — The St. Johns River Water Management District will close its offices districtwide on Thursday and Friday to give employees time to prepare their homes for Hurricane Matthew. Additionally, all district public lands are closing as of sunset today. PALATKA, Fla., Oct. 5, 2016 — As Florida’s east coast braces for impacts from Hurricane Matthew, the St. Johns River Water Management District will close its Palm Bay Service Center at 3 p.m. today, and the office will remain closed on Thursday and Friday. District management will continue to evaluate the path of the storm and may close other offices and public lands as conditions intensify. PALATKA, Fla., Oct. 5, 2016 — Preparing for the possibility of impacts from Hurricane Matthew later this week, the St. Johns River Water Management District will hold its monthly Governing Board meeting at its Palatka headquarters on Tuesday, Oct. 11. The board had been scheduled to meet off-site Tuesday in Ormond Beach as part of its ongoing commitment to being accessible to the public and stakeholders.